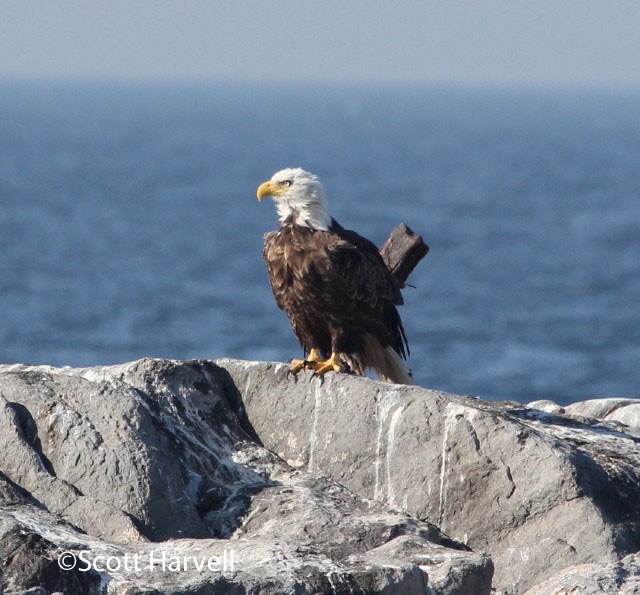 In my last blog, I predicted some great birding was in store for us here in Maine. Our entry into “Rarity Season” coupled with an active weather pattern was undoubtedly going to make for some exciting birding in the near future. It certainly started off with a bang! …a Sabine’s Gull was discovered on Sabattus Pond. This gorgeous gull was my 373rd species in Maine, and while I knew I was going to see one sooner than later, I expected to finally get one in Maine waters during my Washington County Weekend tour (we were close! ), and not well inland on a small lake! Whether blown inland by the strong winds or “grounded” as it cross-cut over land, this pelagic is not what one expects while scanning the ducks at Sabattus. An early 1st Winter Iceland Gull (later, two), and a rare-inland sweep of all three species of scoters (9 Surf, 4 Black, and 1 White-winged) were all related to the weather as well. Similarly, an adult Black-legged Kittiwake out of place in a pond at Fortune’s Rocks Beach on Sunday was likely storm-related. 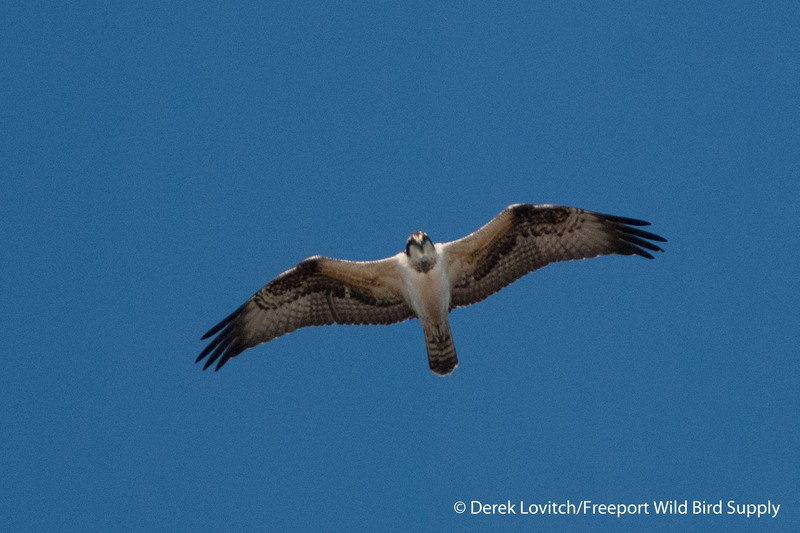 Although regular to downright common offshore, this is not a bird we usually see onshore in southern Maine. 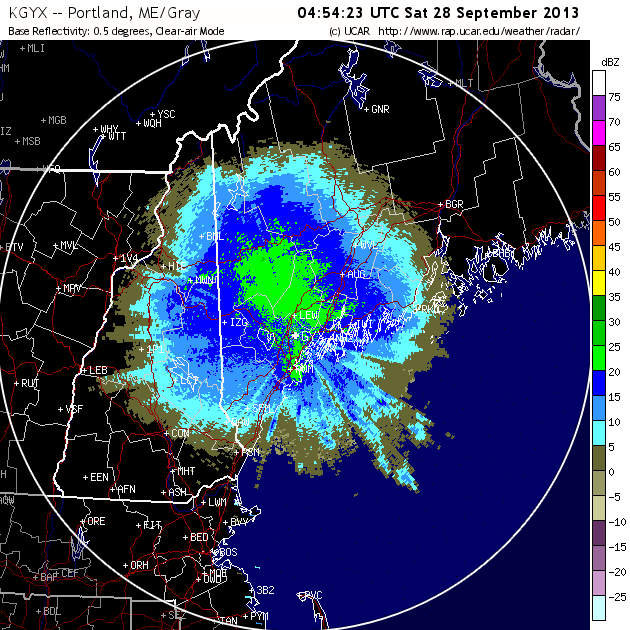 One can only imagine what else was on the 2,600+ lakes in the state of Maine during and immediately after the storm! Jeannette and I did check a few spots around Sebago Lake on Halloween, but it was surely too long after the storm, and the only birds of some note we turned up were single Dunlin and Black-bellied Plover (fairly rare inland, especially this late) at Raymond Town Beach. I bird hard this time of year, doing my best to finish projects and keep my schedule as clear as possible to afford as much time in the field during these fruitful weeks. While I skipped birding in Portland, I did cover a lot of ground, and searched for odd birds in odd places, as well as focusing on the seasonal “migrant trap” hotspots. As for wayward vagrants seen around the state by others, there were quite a few from the south: a Blue Grosbeak in Portland on 10/31, a couple more Yellow-breasted Chats were found here and there, and most surprisingly, a Blue-winged Warbler in Saxl Park in Bangor on November 7th – this early migrant simply has to be a reverse-migrant or 180-degree misoriented migrant from points south; right? And the headlines, from the southwest, as a Cave Swallow reported from Cape Elizabeth on the 12th. From the west (and/or mid-west) came a Clay-colored Sparrow at Two Lights State Park on 11/6 and a few scattered Dickcissels around the state (but where are the Western Kingbirds this year?). A Cattle Egret in South Thomaston on 11/6 and another in Pittston on the 13th could have come from either direction. But it’s not just rarities that make this time of year so much fun. There are all of the regular migrants that are still “lingering.” Some of the late birds that I have seen in the past weeks included a Red-eyed Vireo along the Saco Riverwalk and 1 Semipalmated Sandpiper at Biddeford Pool Beach on 10/30, a Red-eyed Vireo at Sandy Point on 11/1, a Pine Warbler and a late-ish Winter Wren on Bailey Island in Harpswell on 11/4, a slightly tardy Yellow-bellied Sapsucker with Jeannette at Beaver Park in Lisbon on 11/8, a Turkey Vulture over Falmouth on 11/11, two Winter Wrens on Peak’s Island on 11/14, and a smattering of Hermit Thrushes. Other birders also reported the usual slew of truant migrants, such as a smattering of Baltimore Orioles, a couple of Scarlet Tanagers, and a decent variety of late warblers here and there. There’s still a Marbled Godwit, 4 American Oystercatchers, and 2 Red Knots at Hill’s Beach in Biddeford Pool; I enjoyed them on the 30th, but they continued to be reported through at least 11/2 with the godwit still being reported as of 11/12! A few Long-billed Dowitchers were reported, with the one at Sabattus Pond on 11/5 being at the most unexpected location. The winner, however, is the immature female Ruby-throated Hummingbird that appeared at a feeder on Cousin’s Island in Yarmouth on November 10th! I viewed it the next morning and it continues through today, the 14th. Although the photos taken by the homeowner looked good for “just” a Ruby-throat, I hoped I was missing something from the still images. Any lingering questions/hopes I had were dashed however. That being said, it’s still a great record. Through our store we have been promoting keeping up hummingbird feeders into November for over a decade, and our database of observations after early October is growing. When I first got a call yesterday, I was sure this was going to be “a good one.” It was Nov 10th after all! Amazingly, this is the same house that hosted a Selasphorus hummingbird last fall! In other words, it sure does pay to keep those feeders out, even if it’s “just” a Ruby-throat! Other, more seasonal, highlights for me over these two weeks included the following. Jeannette and I had 100 Horned Larks along Mayall Road in Gray/New Gloucester on 10/31; 18 Snow Buntings and 13 Horned Larks flew over Bailey Island on 11/4; a Lapland Longspur with 6 Horned Larks were at Stover’s Point Preserve in Harpswell on 11/10; two Ruddy Turnstones were at Winslow Park in Freeport on 11/12 with the Saturday Morning Birdwalk group – one of only two or three places in the state we regularly see them during the winter. This Barred Owl on Bailey Island on 11/4 was a treat. Any day with an owl is a good day! …lots of Horned Grebes arriving all over, 2 Harlequin Ducks at East Point in Biddeford Pool and 3 Purple Sandpipers at Hill’s Beach on 10/30. There were also plenty of Dunlin and Sanderlings around this week, such as this one Dunlin nestled amongst the Sanderlings on Biddeford Pool Beach on the 30th. Waterfowl migration is in full effect, and not just at Sabattus Pond (although that is certainly one of the top spots in the state). Scoters, Long-tailed Ducks, Red-breasted Mergansers are all piling in, and dabblers are also on the go, such as the single drake Northern Pintail and American Wigeon at Great Pond in Biddeford on 10/30. Common Mergansers are also now arriving; I saw my first migrants at Sebago Lake on 10/31. Jeannette and I visited Sabattus on a gorgeous, warm day on the 8th, with glass-calm conditions allowing for careful combing through the masses: 649 Ruddy Ducks, 510 Mallards, 176 Lesser and 119 Greater Scaup, 104 American Black Ducks, 73 Buffleheads, 69 Hooded Mergansers, 40 Common Mergansers, 13 Northern Pintails,11 Common Goldeneye, 8 Green-winged Teal, 5 White-winged and 1 Surf Scoter, 4 American Wigeons, 4 Common Loons, and a very-rare-inland Red-necked Grebe. On 11/13, I returned with a Birds on Tap – Roadtrip! tour with our partners at the Maine Brew Bus. Although I didn’t count everything as carefully as I do when on my own, “Fall Ducks and Draughts” did record 600+ Ruddy Ducks, 3 Gadwalls, AND 2 White-winged Scoters amongst the 14 species of waterfowl present. The “Greater Yarmouth Goose Fields” have been slow this year so far, likely also due to the mild weather and lack of early snowfalls to our north. In fact, the only “good” goose so far has been a “Blue” Snow Goose that showed up during the week of October 17th continuing through at least 11/11. Canada Geese numbers remain rather low however; I have still not surpassed even 600 total birds this season. There’s still some passerine migration a’happening, as well. For example, my last two days at Sandy Point for the season yielded 221 birds on 10/31 (led by 123 American Robins and 18 American Crows) and 131 on 11/1 (led by 59 Dark-eyed Juncos and 44 American Robins). Common Grackles and a smattering of Red-winged Blackbirds are still heading south, although their numbers are greatly reduced over the past week. Sparrows also continue to move through, with lots of Dark-eyed Juncos and White-throated Sparrows on the move, and my first American Tree Sparrow arriving at the Yarmouth Town Landing on 11/5 during our Saturday Morning Birdwalk, followed by more as the weeks progressed. 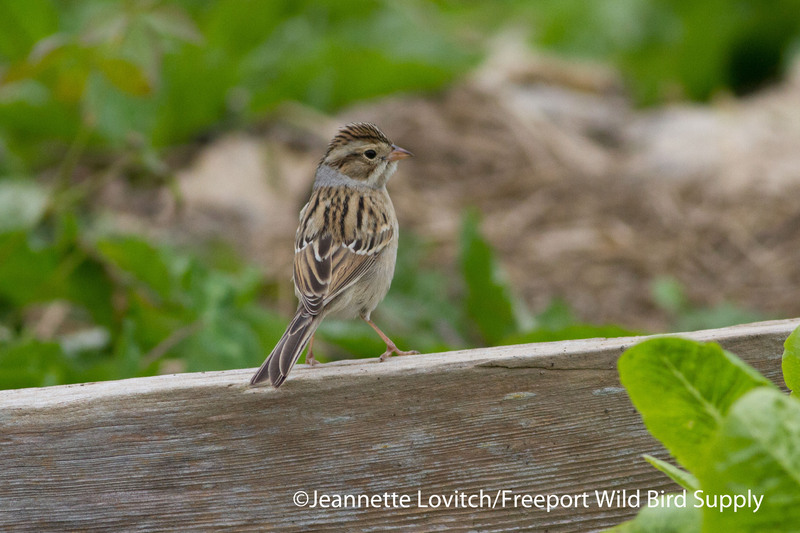 A White-crowned Sparrow at Biddeford Pool on 10/30 was getting late, but there are still scattered Chipping Sparrows here and there as usual, including one still here at the store’s feeders. This junco on our back porch on November 6th appears to be of the inter-mountain subspecies/hybrid swarm often labeled as “cistmontanus.” It’s definitely not a pure “Oregon” Dark-eyed Junco, and the curved hood with buff of the sides traveling up to below the fold of the wing, however, suggest that this is not a pure “Slate-colored” Junco either. And speaking of feeder birds, a recent spate of Evening Grosbeak reports (I have heard or seen several 1’s and 2’s recently, but 6 were at Old Town House Park on 11/3), along with an uptick in Purple Finches and Pine Siskins are suggestive of a decent winter around here for at least some of the finches. 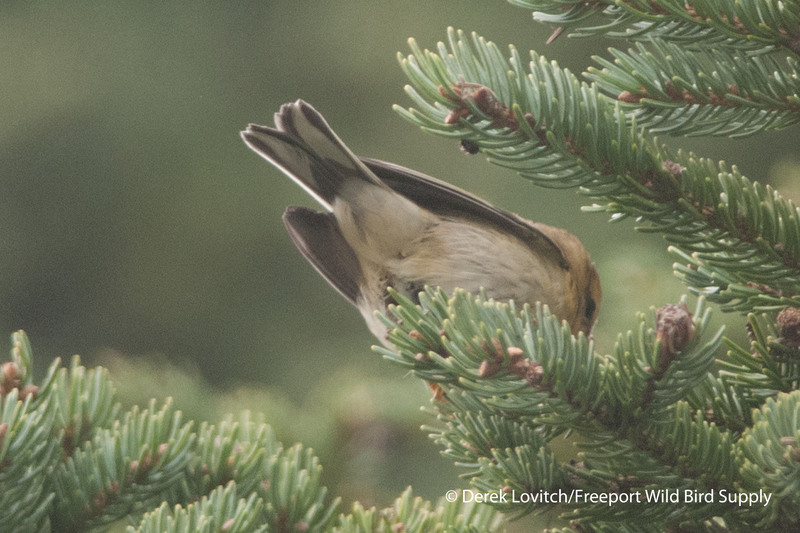 I also had a few single Red Crossbills fly over in a handful of locations recently. And the first Northern Shrike reports have started trickling in. But overall, we’re off to a fairly slow start to the November Rarity Season. 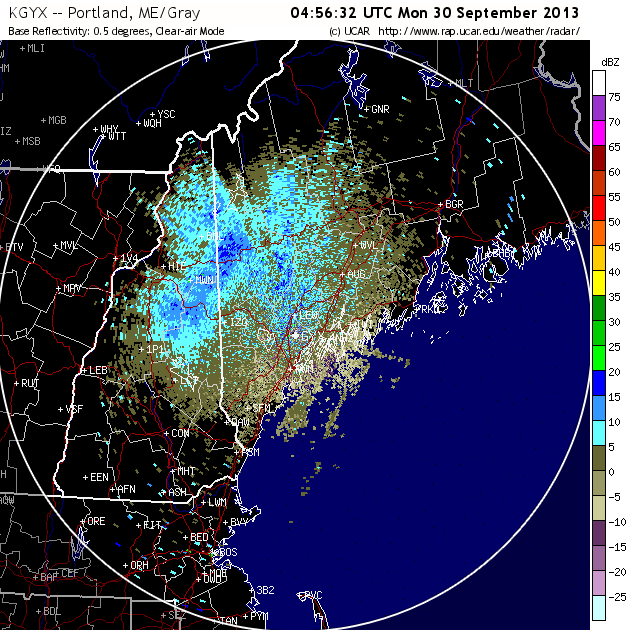 My guess is the lack of cold fronts early in the fall ushered fewer birds east (e.g. Western Kingbird) but also it remains fairly mild. I’m just not sure birds have begun concentrating yet in places that birders find them (like coastal migrant traps, city parks, etc). But as temperatures continue to drop, this might change. Afterall, after a very slow November last year (also very mild), December was simply incredible. As the shorter days get colder (maybe), I would expect more birds to begin turning up, especially at feeders and along the immediate coast. The coming weeks always produce something remarkable. A blast of cold, Canadian air finally arrived this past weekend, as evidenced by the wind map of 11/11. However, it might be hard to top the incredible and unprecedented White Wagtail that showed up in Rye, New Hampshire on 11/2 through early the next. You know I’ll be trying though! This entry was posted in Birding in Maine, Rarities and Vagrants, Uncategorized and tagged "Birds, Barred Owl, Birding, Black-legged Kittiwake, cistmontanus Dark-eyed Junco, Dark-eyed Junco, Dunlin, Harpswell, Ipswich Savannah Sparrow, Lark Sparrow, migration, Pott's Point, Rarity Fever, Rarity Season, Ruby-throated Hummingbird, Sabattus Pond, Sabine's Gull, Sanderling, vagrants, Weather, Yarmouth on November 14, 2016 by Derek. 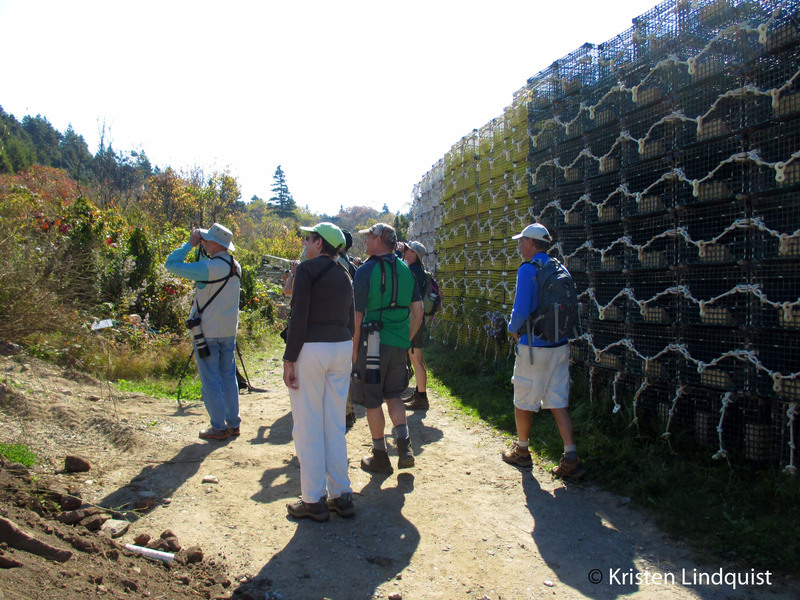 Every other year, I have the pleasure of spending a week on Monhegan Island in the fall with a tour group for WINGS. Unlike my annual weekend tour through the store, this allows us to fully experience multiple changes in the weather and the resultant changes in bird numbers and diversity. This year’s tour, which took place from September 19-25, recorded 116 species (including 5 seen only from the ferry or while we were on the mainland), including 18 species of warblers. Both tallies were a little low, as the weather was often simply “too nice” for much of the week, and fewer birds found themselves on the island. But as usual, great looks at a wide variety of common birds, spiced up by a smattering of rarities, made for a wondrous week of birding. Birds from any direction are possible at this migrant trap, and this week, we experienced visitors from the south (e.g. Orchard Oriole), west (e.g. 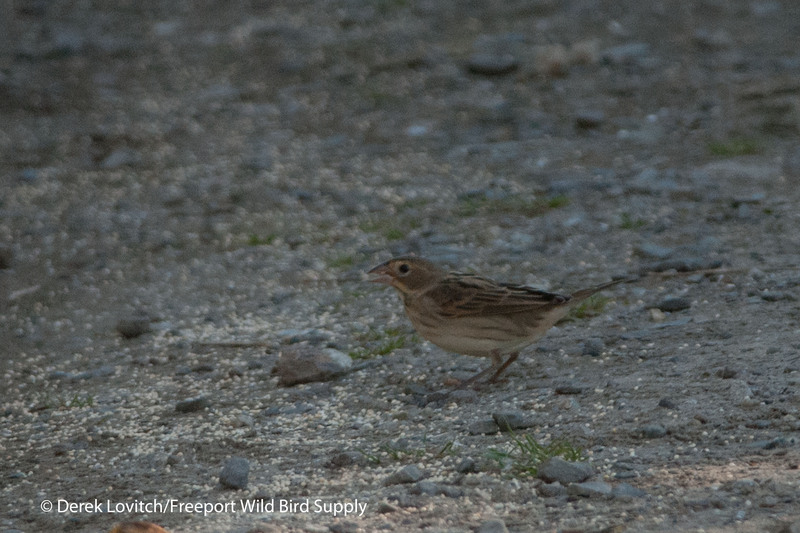 Lark and Clay-colored Sparrows), and even the east (Cory’s and Great Shearwaters). While the allure of a “Mega” kept us searching, local rarities kept us entertained. 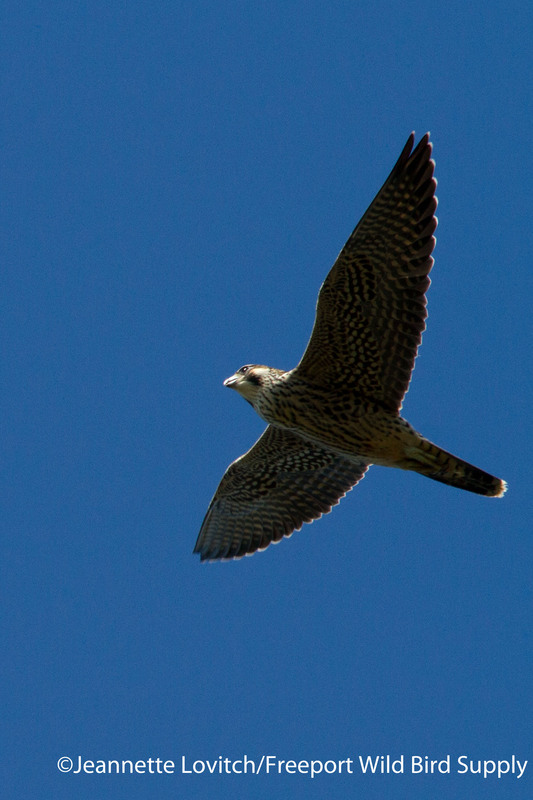 From Peregrine Falcons overhead to a Sora at our feet, you never quite know what’s around the next corner. Even the “slow” days offered new birds, as our relaxed and casual pace simply allowed us the opportunity to enjoy whatever happened to be in front of us. And the overall weather and food was unbeatable – adding to the mystique of this truly special place. 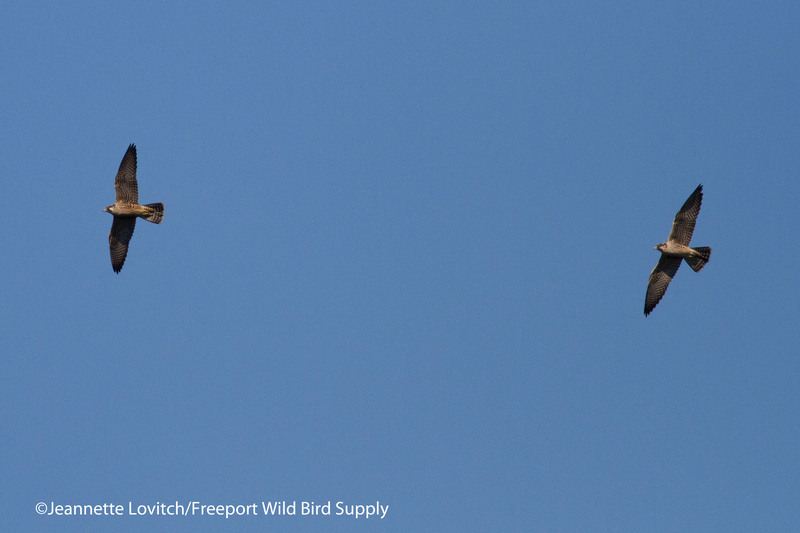 While daily turnover in the island’s birdlife is expected during the peak of fall migration, a shift in the weather can yield a distinct change in the birds we see. Several clear and calm nights allowed migration to continue unimpeded, while a northwesterly wind on the night of the 22nd yielded numerous birds overhead in the morning – including our first big push of Yellow-rumped, Palm, and Blackpoll Warblers. 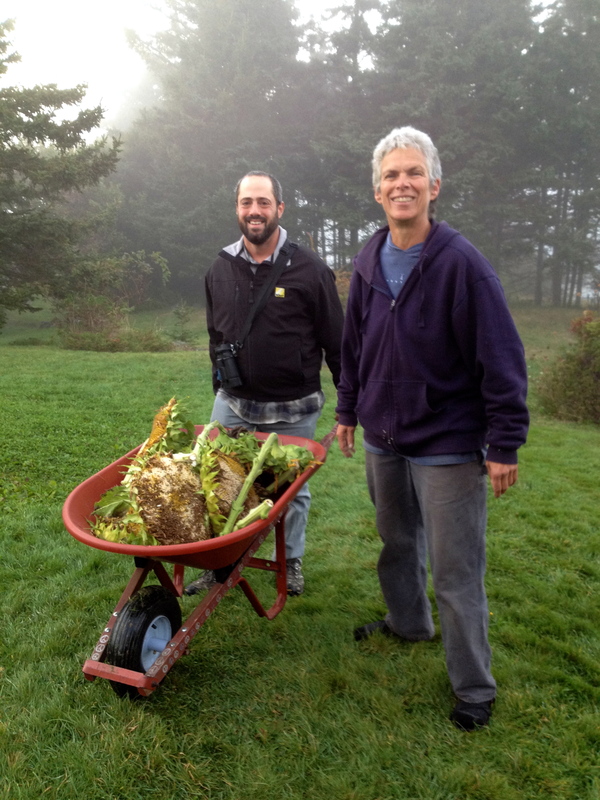 However, no fallouts – the stuff Monhegan birding legends are made of – occurred this week as unseasonably warm and relatively pleasant weather continued. 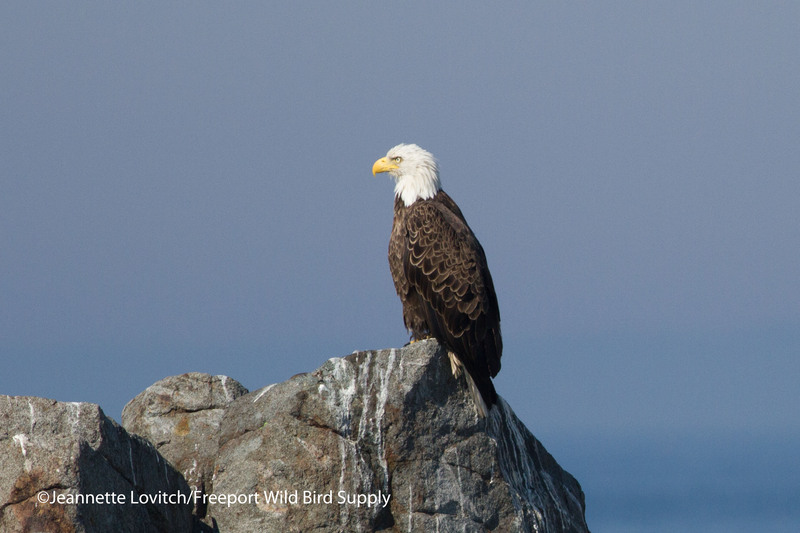 It might not have produced massive numbers of birds, but it sure made for comfortable birding! 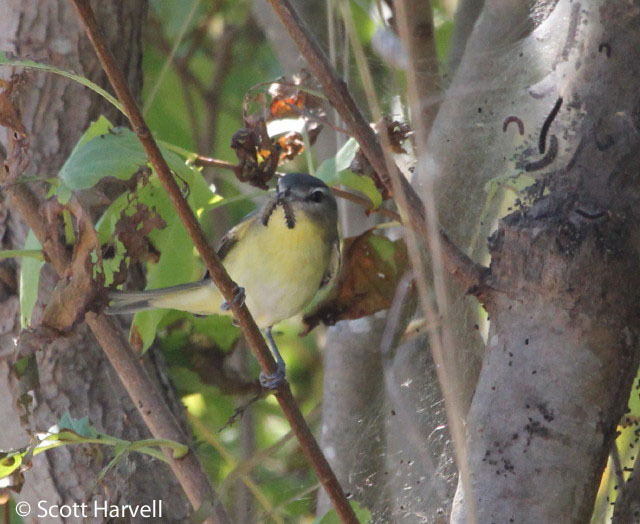 A couple of nights of southwesterlies produced dreams of vagrants, and likely resulted in the arrival of several “southern” birds such as Orchard Oriole, Yellow-throated Vireo, and Blue-gray Gnatcatchers. In contrast, by week’s end, the first White-crowned Sparrows, Dark-eyed Juncos, and other late-season migrants from the north began to appear. “Drift migrants/vagrants” such as Lark Sparrows and Clay-colored Sparrows, along with a number of Dickcissels, all normally found further west, were present and accounted for as usual out here. Two immature Yellow-crowned Night-Herons (perhaps part of a small scale northward irruption into the New England coast) stood guard in the early mornings at the Ice Pond. Later in the week, the world’s most confiding Sora appeared, spending one afternoon foraging in the open at the pond’s muddy edges – this year’s drought had reduced it to a mere muddy puddle. 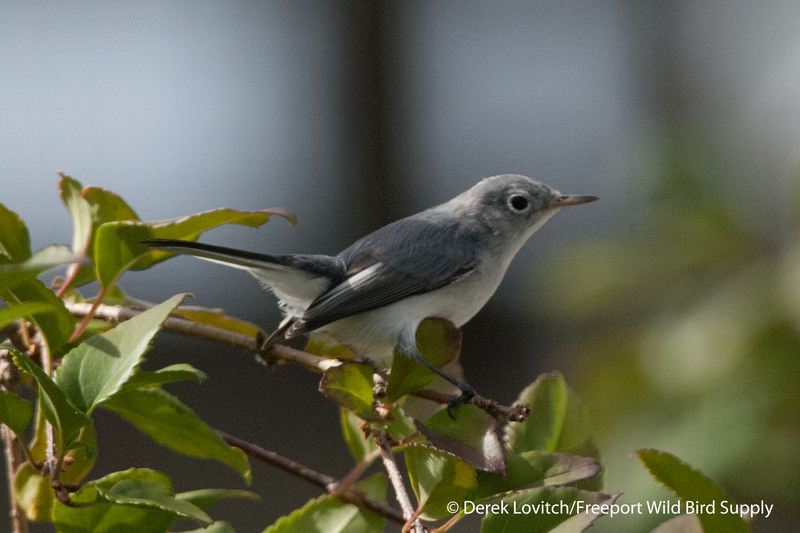 A Connecticut Warbler was one of our finds of the week, heard by all, seen by some on two occasions; an “exclusive” for our group. 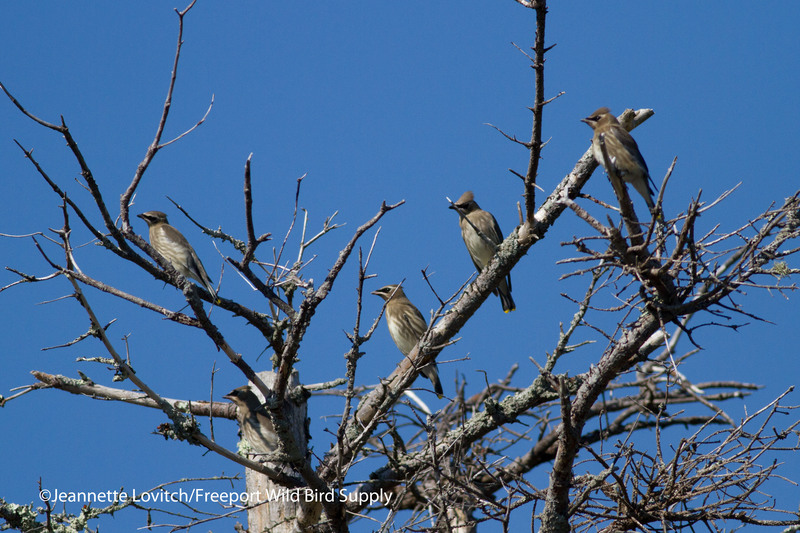 A late Olive-sided Flycatcher was another treat, as was the Black-billed Cuckoo that we caught up with thanks to the efforts (and game of charades) of friends – exemplifying the spirit of the Monhegan birding community shared by most. Calm winds and the season produced excellent seawatching conditions on the 21st, and from the high cliffs of White Head, we observed Cory’s Shearwaters (once a rarity this far north and east) and Great Shearwaters – with massive rafts of one or both just beyond the realm of identification– and a few Minke Whales. Always a highlight in the fall is the raptor passage, which most of the week was limited to numerous Merlins, scattered Sharp-shinned Hawks, and the occasional Peregrine Falcon, On our last day, a light northerly wind also ushered in a steady movement of Northern Harriers and Ospreys, along with another surge of falcons. And then there was the food: exquisite fine dining at the Island Inn, the best pizza in Maine at the Novelty, and a candlelight lobster dinner – with lobsters brought in just for us! – at the rustic Trailing Yew, complete with a lobster ecology and human ecology lesson and step-by-step instructions. And that’s in addition to the limitless lobster scrambled eggs at breakfast every morning! Highlights for our group each day were as follows, along with a brief synopsis of the overnight flight and the day’s weather. – A few light showers, drizzle, and fog occasionally lifting on light and variable, and rather warm winds throughout the day. Calm and foggy at dusk. Like everywhere in Maine this fall, Red-breasted Nuthatches were abundant. Ichneumon wasp sp on window screen. – Sunrise: 62F, dense fog, very light southeast. 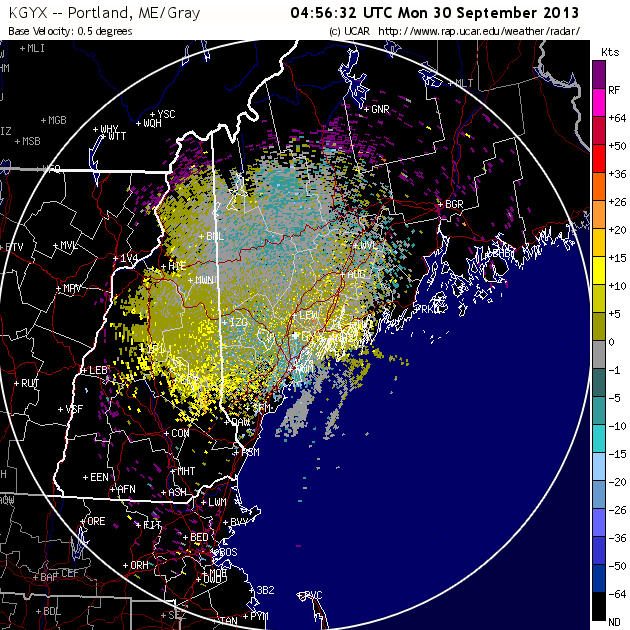 Light migration likely overnight, but hard to decipher on the radar due to fog. Fog coming and going throughout the day, warm and humid, very light southeast. Light south and fog at dusk. 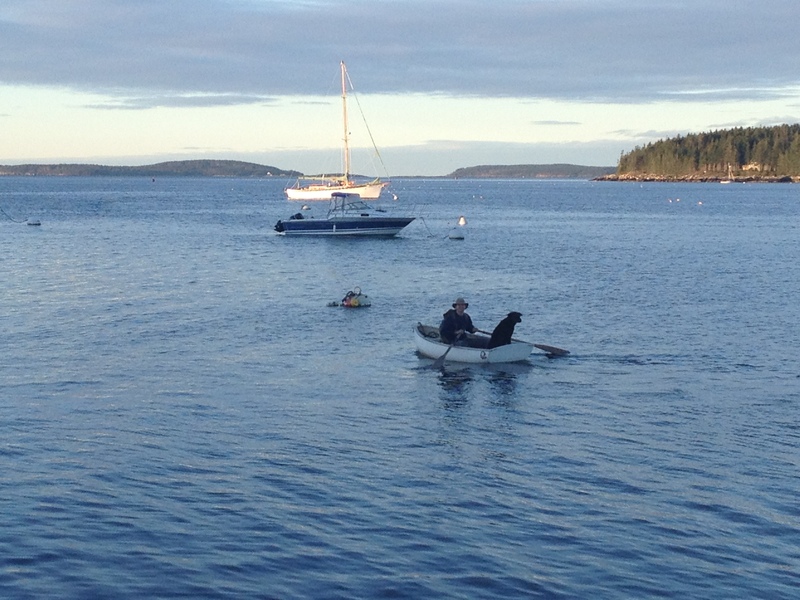 I tell people never to leave their binoculars behind when on Monhegan; you never know what you will see where. They also can come in handy for reading the fine print of menus! – Am: 62F, mostly clear, calm. Light to moderate migration overnight on lt SW to W, but again intensity obscured by fog. Moderate-good morning flight overhead at dawn, with lots of new birds around. Hot and calm! Clear and calm at dusk. 73 species on the day, including the world’s most cooperative Sora and some fantastic afternoon seawatching. – 10 Cory’s and 12 Great Shearwaters plus 125 large shearwater sp. 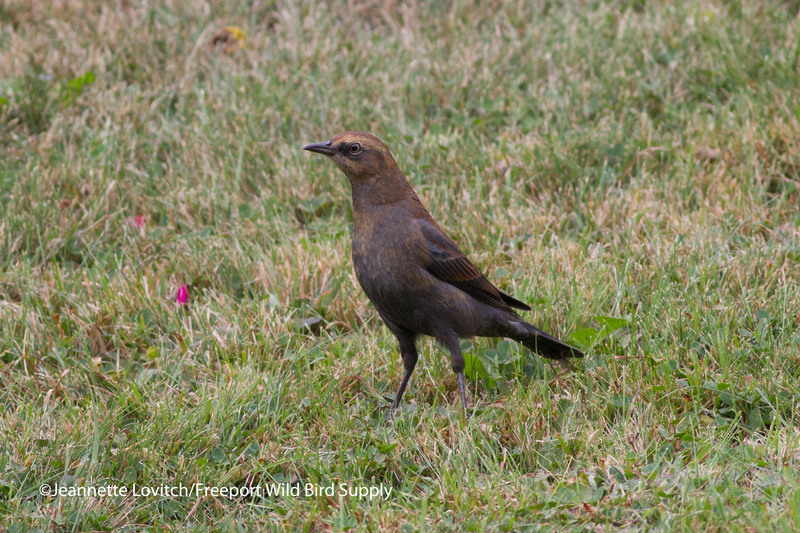 I’m not sure of this Rusty Blackbird left this particular group of yards for the rest of the week! – AM: 59F, clear, very light NW. Light-moderate migration overnight on light SW to West to NW. Lots of birds overhead at sunrise (mostly Blackpoll, Yellow-rumped, and Palm Warblers), but less landing than expected as many birds kept going to the mainland. Relatively hot once again, with light and variable breeze. Clear and light South by dusk. Unidentified caterpillar- some sort of tussock moth? – AM: 65F, cloudy, lt-mod SW. Little to no visible migration overnight on lt-mod SW and rain approaching from north with dropping cold front. Drizzle and some light rain ending by mid-morning. Overcast but warm on light west winds. Increasing north by dusk. A slow day of birding on Monhegan is better than a good day of birding most anywhere else with NINE new species for the week today. 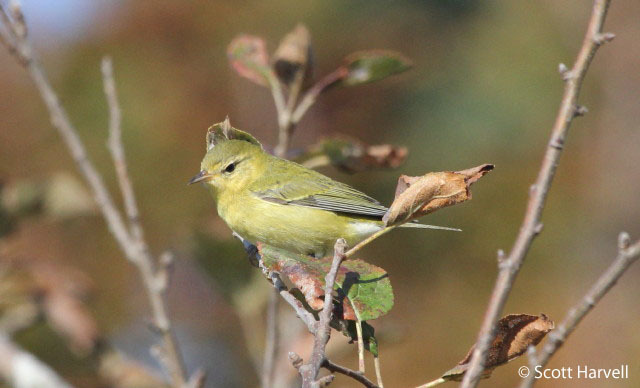 – pair of Pine Warblers were our 18th species of warbler on the week (a little low). 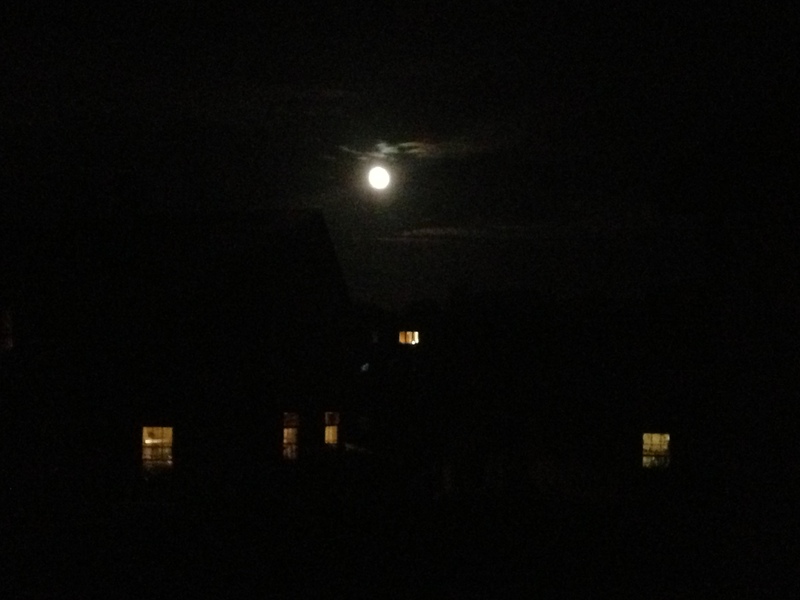 – 50F, mostly clear, light N. Huge flight overnight on radar on diminishing N, but very little overhead at dawn. Although new birds had definitely arrived, it was not the huge flight that was hoped for. Apparently, there were more birds arriving on the south end of the island today (we always started on the west-north-west side) as reorienting migrants were returning to the island, or likely departing from the island’s north end. Diminishing N wind became light and variable before NW began to increase in the late morning, producing a good hawk flight. With the hopes a big flight dashed by the lack of a westerly wind component by morning, we had a very casual and relaxed pace for our last day with some hawk watching taking precedence. Quite a few new birds were around, including several new species for out week’s list: Northern Harrier, American Pipit, and a single Semipalmated Plover. Cape May Warblers were particularly conspicuous today (at least 5), and as always it is painful to say goodbye. Good thing I’ll be back next weekend with the store’s annual weekend! And now I’m off this afternoon for for three more days! This entry was posted in Birding in Maine, Private Guiding and Tours, Weather and tagged "Birds, Birding, Black-billed Cuckoo, Blue Jay, Cape May Warbler, Clay-colored Sparrow, Connecticut Warbler, Cory's Shearwater, Dickcissel, Lark Sparrow, Merlin, migration, Monhegan Island, Rusty Blackbird, Sora, Weather, WINGS on September 29, 2016 by Derek. Philadelphia Vireo wrasslin’ a Fall Webworm. There are few places in the entire Northeast that I would rather be in fall, especially during the peak of migrant diversity. 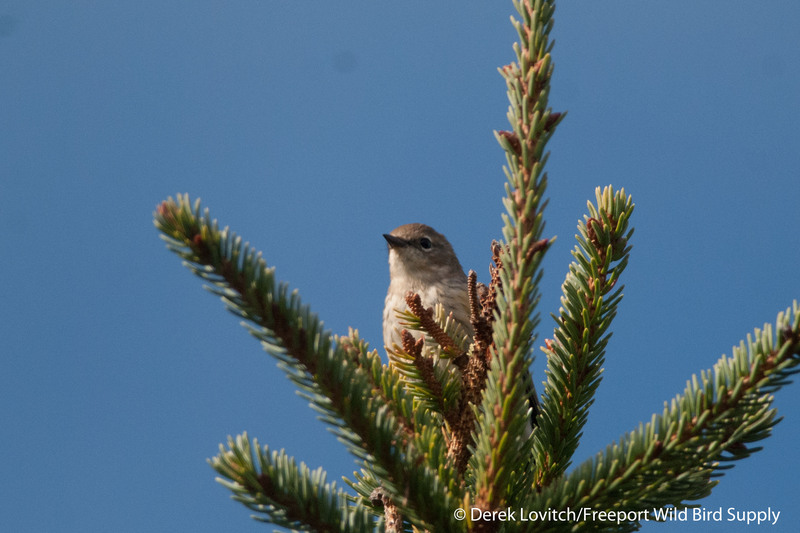 Our annual tour takes places to coincide with the last waves of warblers, first waves of sparrows, peak of raptors, and the beginning of “Rarity Season.” Check, check, check, and check…and it was hot! In fact, I believe I received the first ever complaint of a room at the Trailing Yew being “too warm in the morning.” Of course, “complaint” is used loosely here, for the record. But it was an unusually warm weekend, and although the birding was not epic by Monhegan standards, great diversity was thoroughly enjoyed – as was the weather (well, at least until the boat ride home a day after the tour ended!). Two Red-necked Grebes just outside of the harbor were a nice way to start the trip on Friday, as were plenty of Northern Gannets, several Common Loons, and glass-calm seas on our way across. Arriving at 10am via the Hardy Boat from New Harbor, we hit the ground running, and after dropping our bags off to be taken to our inn, we immediately began to bird. Two vocal, dogfighting Peregrine Falcons got us started, and we soon spotted the single continuing Dickcissel. That’s how I like to get things started! Although we did find a Yellow-breasted Chat (frustrating as usual, although at least everyone saw twigs moving), the bird of the day was definitely Peregrine Falcon. A bona fide kettle of 8 were soaring overhead at lunch time, and a steady parade of birds was passing overhead throughout the day. There was a lot of swirling as well, however, which made tabulating an actual count of Peregrines impossible. We know we had at least a dozen birds, but likely multiple times that. 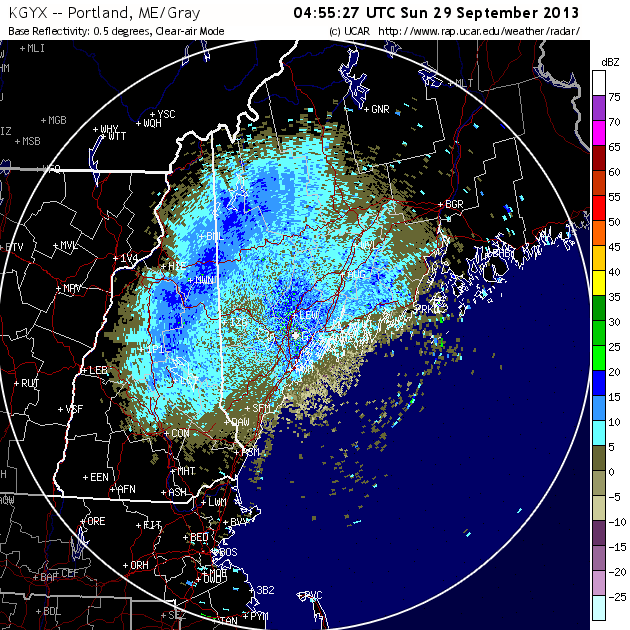 Some birds were clearly hunting, but most were probably rising high on the thermals and then soaring off to the south, using the light headwind to efficiently move out to sea, and likely not making landfall until Cape Cod! Unexpectedly, very light southwesterly winds shifted to west overnight, and as a result, we had a very good arrival of birds to the island. Yellow-rumped Warblers – as expected for the date – dominated, with a conservative estimate of 250 birds observed, with many dozens in the air over the Trailing Yew at sunrise. Three Cape May Warblers, including a couple at the edge of the Yew were the highlight of dozen species of warblers we recorded today. The immature male Dickcissel continued in his favorite seed pile, and we had a fly-by Yellow-billed Cuckoo over the Ice Pond. 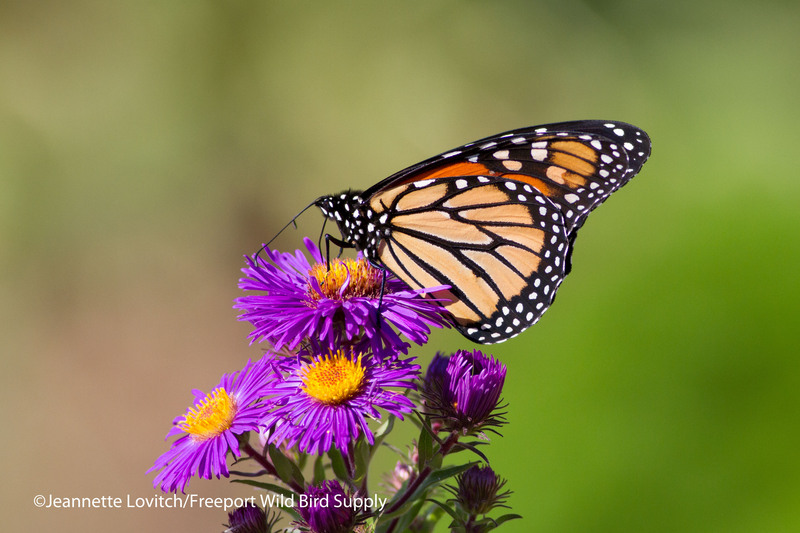 Unfortunately, a short time later, it was found dead below a nearby window, not just sobering our sighting, but punctuating the fact that up to a billion birds a year meet their death at windows each year – and that’s just in the US! 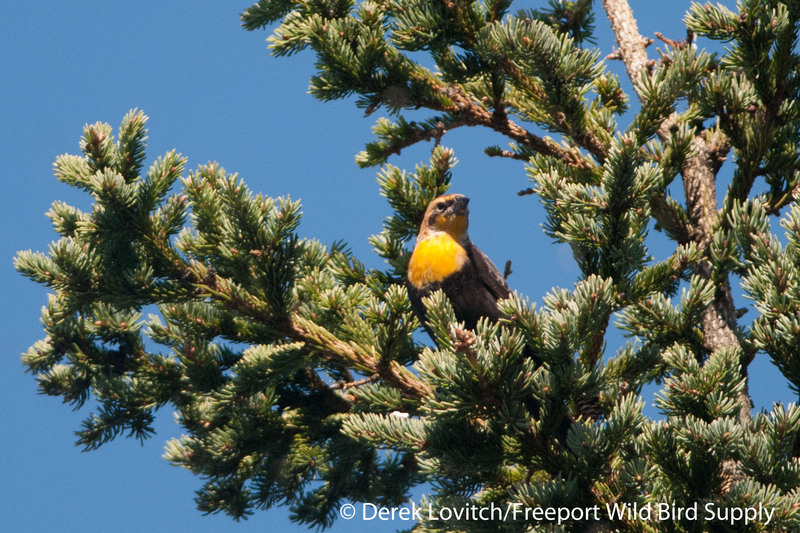 Good diversity and good (but not, by Monhegan standards, great) numbers made for a fun day of birding, but it was definitely a lot more relaxing once we finally caught up with the Yellow-headed Blackbird! This immature male (a lot of folks were calling it a female, but the blackish body, extent of yellow, face pattern, and every-so-slight touch of white on the wing point to this as being a male) had been present for about 4 days, but since it was a “State Bird” for me, and a “Life Bird” for several, it was obviously a priority. 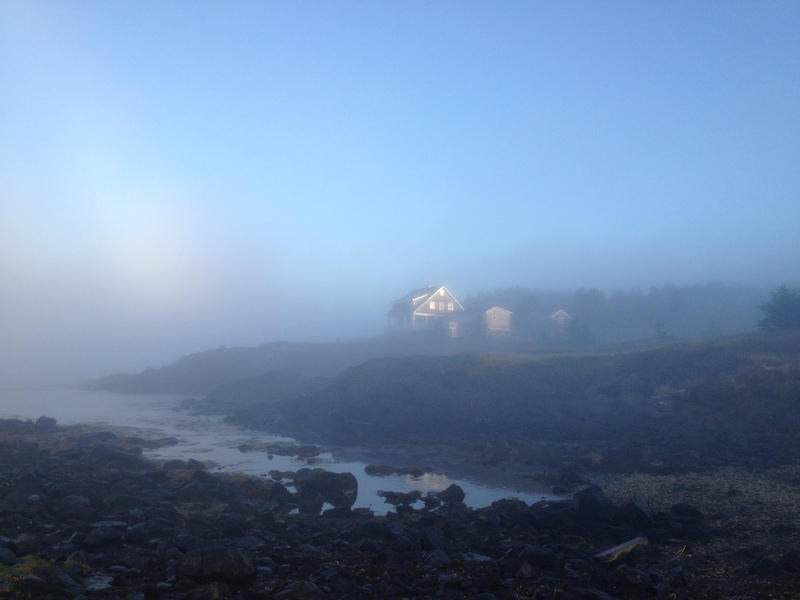 But on Monhegan, you can only do so much to chase most rarities. In fact, more often than not, you have to simply relax and let the rarities come to you! I call this my “MonhegZEN Migration Birding Weekend” not for any existential reasons – or mandatory meditation or yoga – but simply because we (try) to kick back, focus on the bird(s) in front of us, and let good things happen. But yeah, we wanted to see this bird, and after missing it by about 5 minutes on a brisk, pre-breakfast (but don’t worry, post-coffee!) walk, the MonhegZEN kicked in. A friend spotted the bird as it flew overhead, alighting nearby in the center of town. Good looks were had by all (I apparently said, “Oh, thank God,” in response to the bird’s arrival, feeling as much relief as joy, apparently!) but about a half hour later, we had even better views as it perched atop a spruce along Dock Road. We were then able to more thoroughly enjoy the unseasonably warm day, watching Peregrines, and sorting through migrants. Oh, and a relative abundance of Monarch butterflies was heartening. 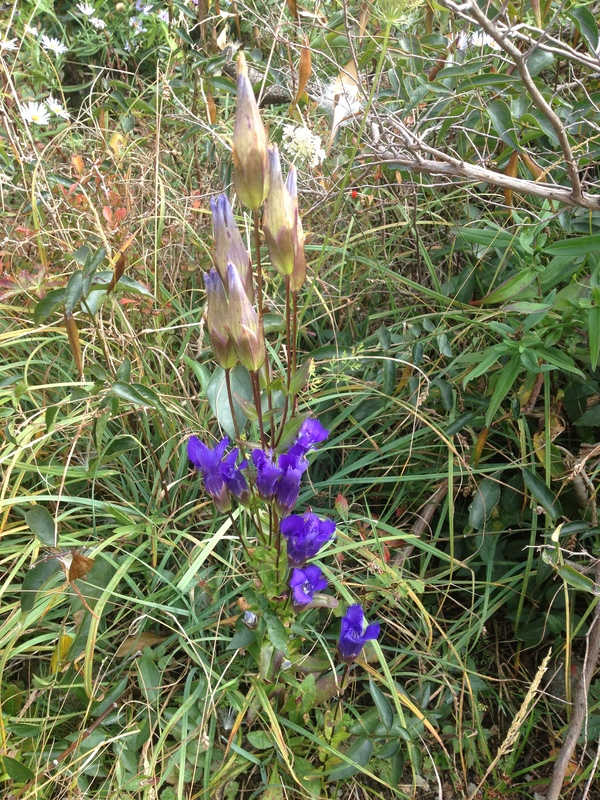 The largest Fringed Gentians I have seen. Bald Eagle on the Outer Ducks as some of the participants took the short afternoon cruise around the island. 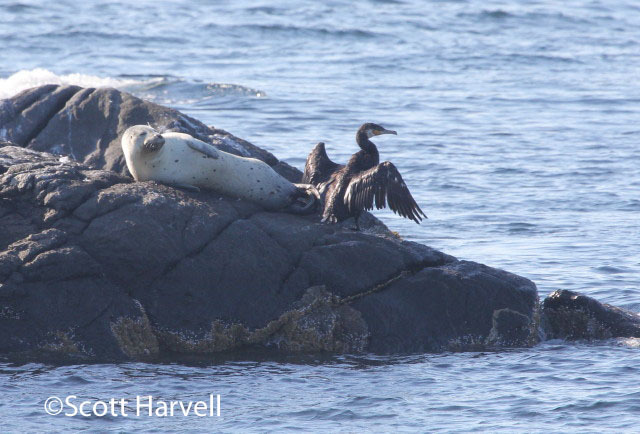 Great Cormorant and Harbor Seal. A moderate-strong flight developed on clear and calm skies overnight, but come sunrise, the morning flight over the Yew was a little less busy than Saturday. 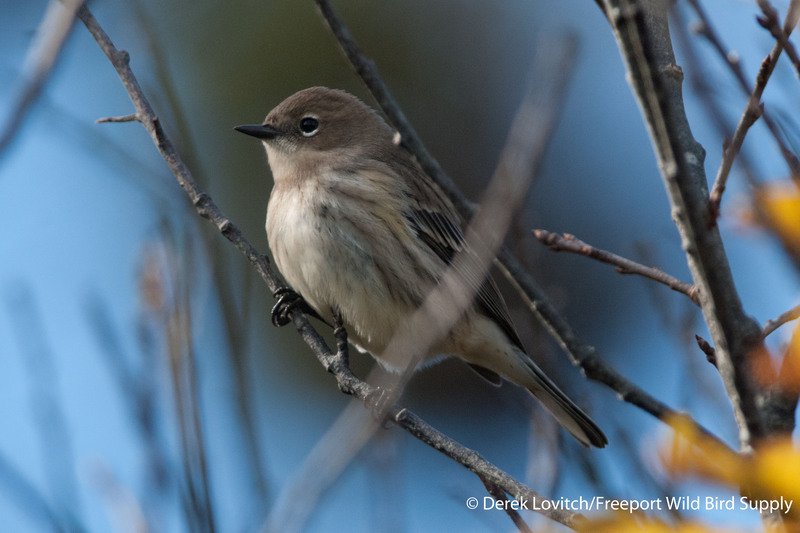 Nonetheless, there were plenty of Yellow-rumped Warblers, Pine Siskins, and noticeable increases in Cedar Waxwings overhead and White-throated Sparrows in the woods and brush. Although overall numbers of birds were lower today, diversity was fantastic, and our trip list grew with the likes of Tennessee Warblers, a Warbling Vireo (I always wonder if these late Warblings out here are all “180-degree misoriented vagrants” as opposed to simply “lingering/late” birds – the local breeders on the mainland are long gone by now afterall), and we finally caught up with the Lark Sparrow that was visiting the seed with the Dickcissel. 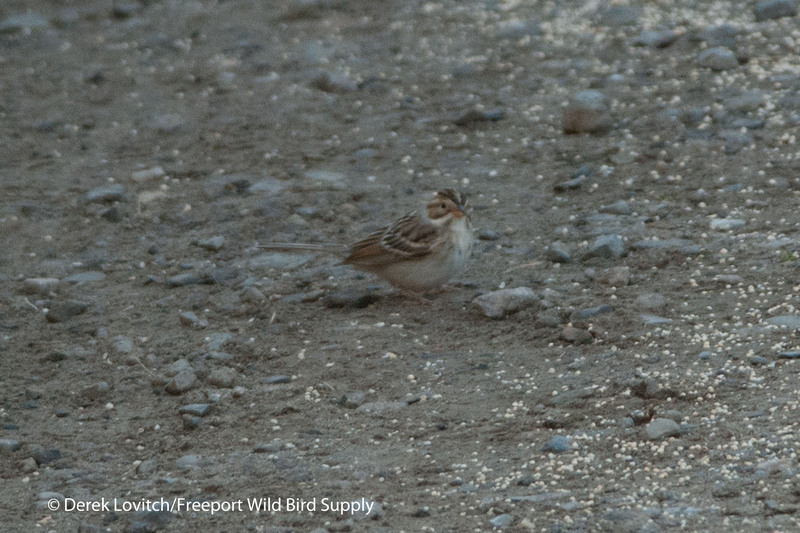 Lark Sparrow with Dickcissel – a classic Monhegan juxtaposition. 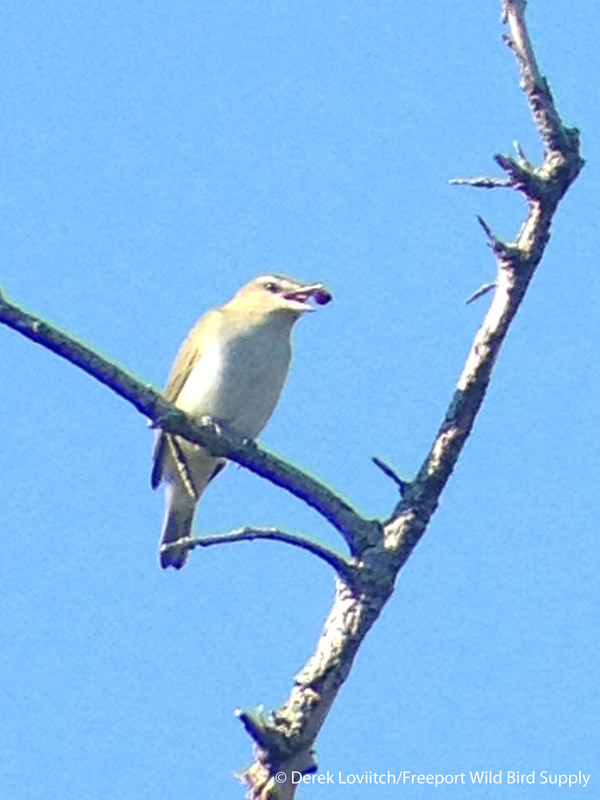 Red-eyed Vireo coughing up a cherry stone; phone-scoped image. We found a female Blue Grosbeak in the marsh behind the grocery store, and we enjoyed another short visit from the Yellow-headed Blackbird (minutes after Jeannette, arriving on the mid-day boat with Sasha, walked away of course). The eagle was present and accounted for on the way in. Due to my schedule, the official weekend tour was only three days this year (instead of the usual four), so most of the group departed on the 3:15 ferry back to New Harbor. Al stayed until the 4:30 Port Clyde boat, and his bonus time (three leaders: me, Jeannette, and Kristen Lindquist who assisted me throughout the weekend as I added a second leader when I added a 9th participant – I, and my clients, prefer a small group, especially on Monhegan!) was partially spent watching a few of us struggle with the identity of a dull warbler who really did not want to give us a good look. It was eventually determined to be an immature female Pine Warbler (actually, quite a good warbler out here), and when Jeannette, Kristen, and I saw it later that afternoon in good light, its ID was much more readily apparent. The always-successful “MonhegZEN Birding Fall Migration Weekend” had officially come to a close, but the birding continued for Kristen, Jeannette, and I. 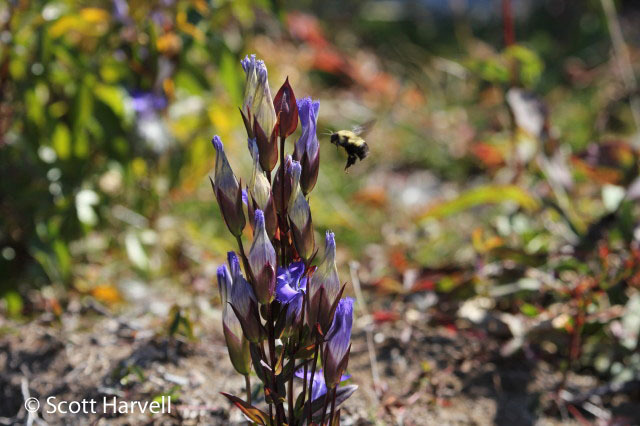 Another hot (80-degrees on the last weekend of September on Monhegan!) and somewhat quiet afternoon relegated our birding to the porch of the Monhegan Brewing Company. Their new delectable DIPA and Pale Ale was thoroughly enjoyed, as was “Brewery Pewee” (a single lingering Eastern Wood-Pewee that was a daily feature of our Brewery List…OK, we didn’t actually keep a brewery list this time, but if we did…and no, this was not my first visit to the brewery on the weekend – it is an important destination for the full MonhegZEN Birding experience) capped the end to a fine and productive day. 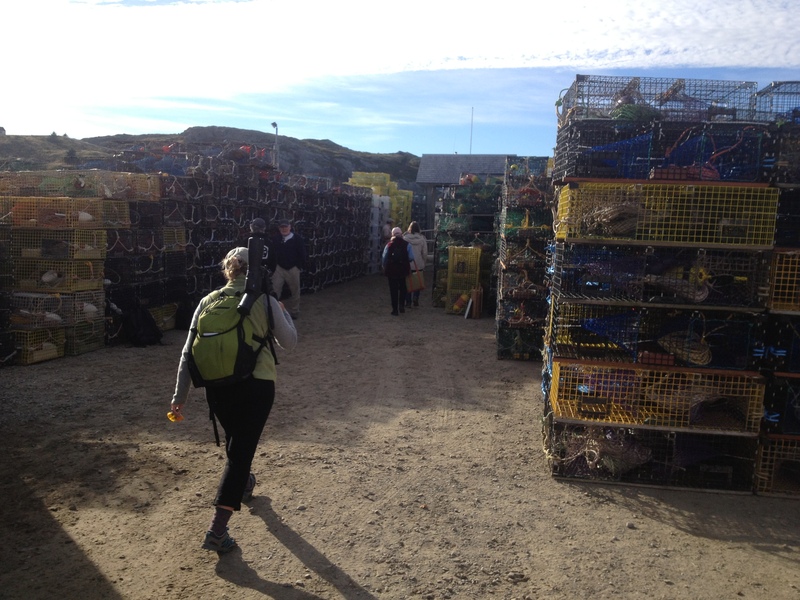 After dinner, the three of us walked to and from the dock (a big school of fish, presumably Herring (?) attracted by the lights provided the post-dinner entertainment), but the mere four migrant call notes heard overhead foreshadowed the very light flight overnight that saw many more birds depart than arrive on a diminishing southwesterly wind. In fact, the skies were nearly devoid of birds undergoing “morning redetermined migration” or “morning flight” come Monday morning, and although there were still plenty of Pine Siskins and Cedar Waxwings overhead, the skies were the quietest that they had been all weekend. But there was little doubt more White-throated Sparrows arrived overnight, and there was not a shortage of Yellow-rumped Warblers. We slowly added a few species to the checklist, including the Clay-colored Sparrow that we had spent all weekend trying to catch up with. The Dickcissel and Blue Grosbeak were present and accounted for as well, and a Prairie Warbler was a nice addition. But as northeast winds began to pick up, we decided to head into the woods. 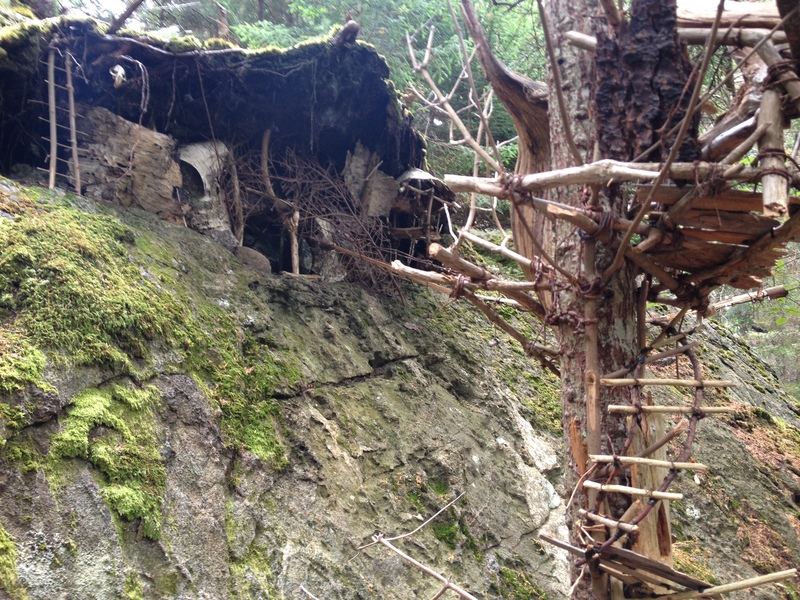 Cathedral Woods offered scattered Golden-crowned Kinglets and more White-throated Sparrows, but our primary destination was this “Fairy House,” or more accurately, palace, that was not to be missed. It was definitely worth the walk, and made even more so by how strong easterly winds were blowing (hmm, that water is looking a little choppy) upon our return to town. It was simply too windy to bird – and rather chilly – after lunch, so we relaxed with a coffee, and then later – just because we “had to” have one more DIPA… err, check of the Brewery Pewee. 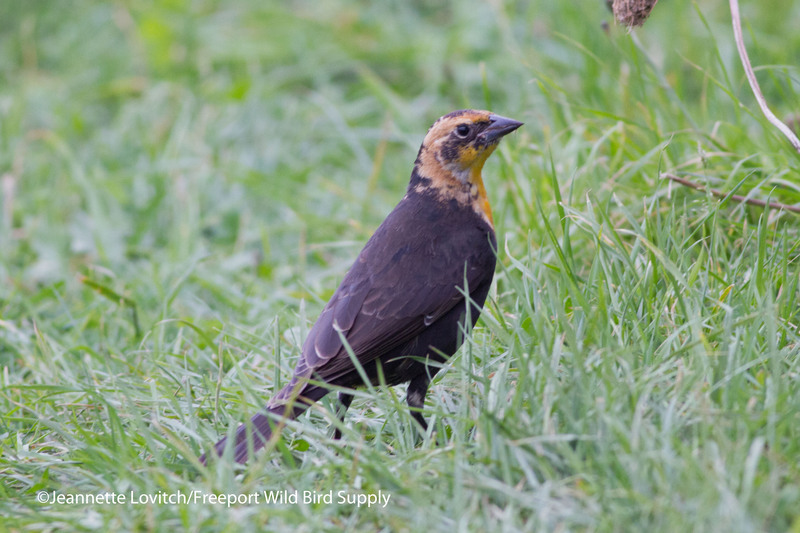 The day’s birding was slow, and we had not been able to relocate the Yellow-headed Blackbird…until the literal last minute. The boat was loaded, and we were hustling to the dock, when we asked two birders what they were looking at in the yard of one of the first houses uphill on Dock Rd. 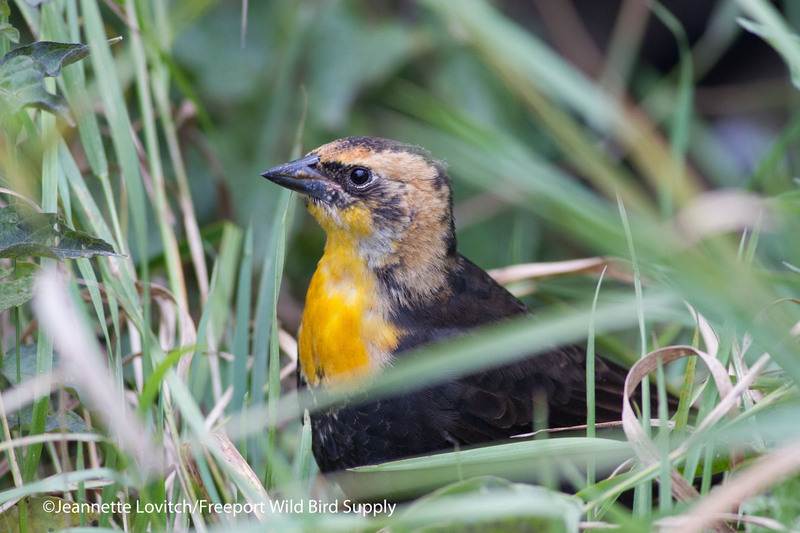 “The Yellow-headed Blackbird.” Of course. And it was, let’s say, confiding, as it walked around the lawn and in some weedy patches a mere 10-15 feet from the gawkers. Sasha even saw it (I would have had a great photo over her head, with her ears up and her face focused on the bird had my phone not just run out of power) – her 127th life bird! It was an exciting way to finish the trip, but the excitement was actually yet to come. “How high are the seas running?” I asked as we boarded the boat. “6-8 feet or so, they’ah sure comin’ up fast today. It’s gonna be a wet ride.” Uh-oh; was that last beer a good idea? While Sasha has only been on a boat a few times, she has never been “tested,” but we thought it was best to keep her outside. Plus, a hot and stuffy cabin was the last place any of us wanted to be in high seas, so we donned our raingear and moved outside. We were amply warned about splash-over, but none of the four of us wanted to head inside. Unfortunately, Sasha was not happy with the vibration on the stern, so we headed upstairs to the exposed top deck. 6-8ft seas? No, they were still growing; more in the 8-10ft range now…by far (actually, well more than double) the highest seas I have ever experienced on a Monhegan crossing. But it was surface chop, and not a deep, rolling swell, so it was actually kind of fun. Except for Sasha and except when a series of waves crashed over the boat and smacked into the four of us. I have never seen our tough dog look so miserable, and frankly, soaked to the bone, none of us were all that comfortable anymore. If any of my group had regrets about leaving on Sunday, I can assure you: be glad! It seemed like forever (OK, it was about an hour) before we passed into the lee of the outermost islands. But don’t worry, in between troughs and huddling over Sasha, I kept my eyes open as much as possible for skuas! That was a wild ride, and very un-MonhegZEN! But once in the sheltered bay and harbor of Port Clyde, we couldn’t help but laugh with the crew. 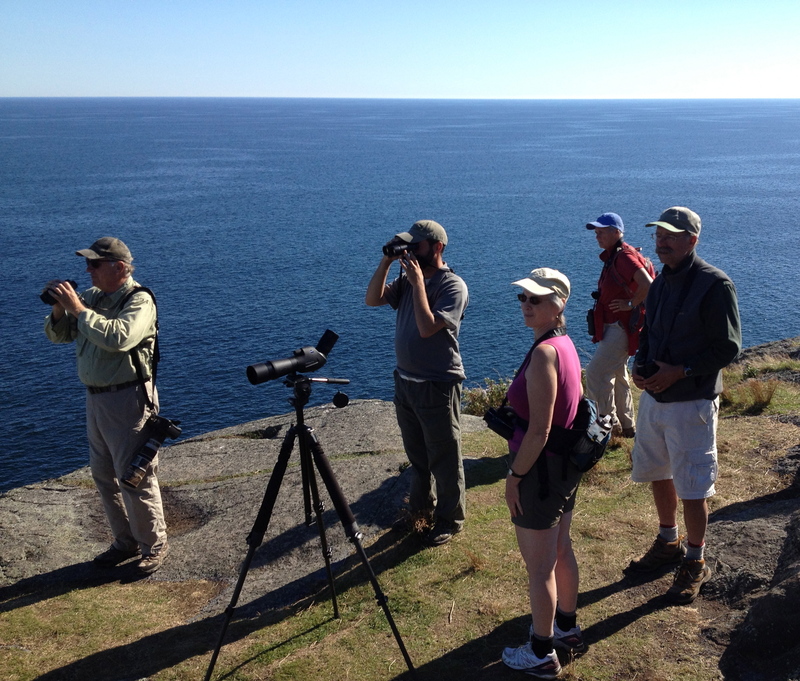 Seas like this are rare – and rarely do they come up so darn quickly – so please do not think that this is part of a Monhegan birding experience! In fact, glass-calm seas were enjoyed by every member of the group on their return trip on Sunday. I guess we might have stayed just one day too long this time. Actually, no, we just regretted not staying just one day longer! Kristen and I tabulated the final day’s checklist on the drive to dinner, bringing my four-day total to 99 species, including this final non-tour day. My 4-day weekend tour averages 102 species of birds, so this was just a little below average (this year’s tour officially ended on Sunday with 93 species, which is just below my 3-day average of 95 species). Here’s the complete, daily checklist. These numbers only represent what our group observed, making no attempt to actually judge the number of birds (at least the common ones) on the island, or summarize the sightings of others and does not include birds tallied on the boat ride across either way. 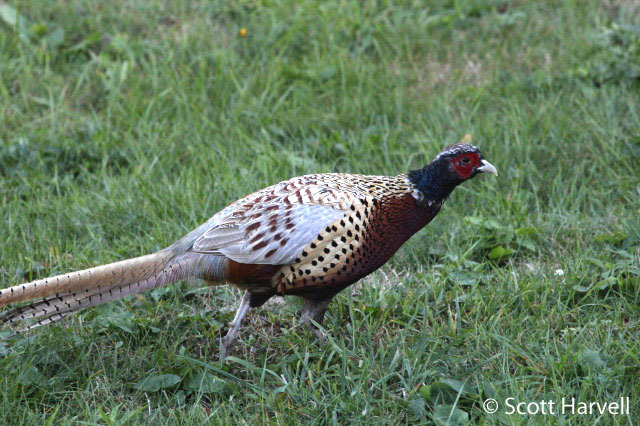 Ring-necked Pheasants – the only “countable” ones in Maine! Beautiful nightly sunsets free with price of admission. 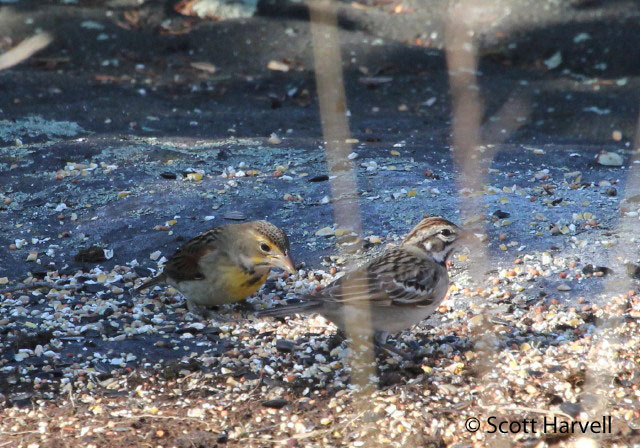 This entry was posted in Birding in Maine, Private Guiding and Tours and tagged Birding, Dickcissel, Freeport Wild Bird Supply, Lark Sparrow, migration, Monhegan Island, MonhegZen Birding Weekend, sparrows, Tours, trips, warblers, Yellow-headed Blackbird on October 2, 2014 by Derek. This past weekend was my annual “MonhegZEN Migration Weekend.” A small group – absolutely no more than eight people per day – joins me on a per diem basis to enjoy the wonder of fall migration at this offshore hotspot. While the 105 total species was right about my Fall Weekend average, it did include 20 species of warblers, and a variety of the usual fall-on-Monhegan cast of characters. And a few “good” birds as always. But before I get into the daily rundown, let me post a quiz. 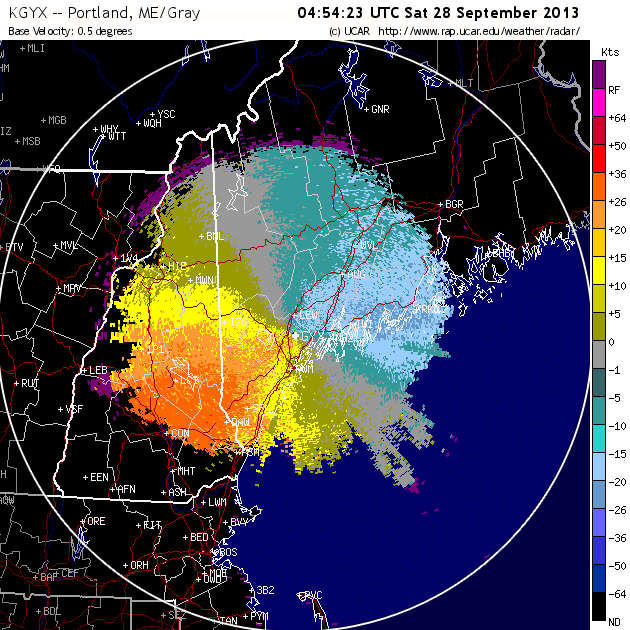 Here are the 1am radar and velocity images from each of the four nights preceeding each of my four days on the island. Can you guess which days had the most birds? If you said the first two had more birds than the second two, you would be absolutely right! And yes, Saturday (Day 2) was definitely the best day for migrants on the island. And yes, Monday (Day 4) was very, very slow. 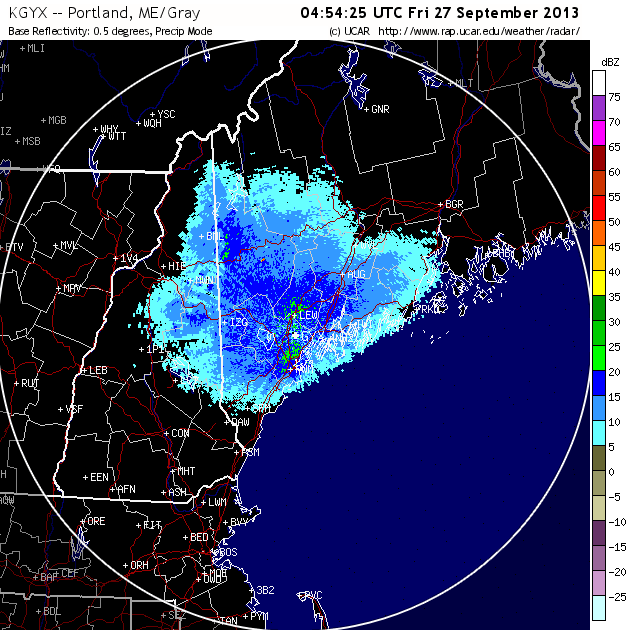 The radar certainly suggested it, and our birding over the course of each day definitively ground-thruthed it. After the good flight on Thurday night into Friday morning, I arrived with part of my group from Port Clyde on the 7am ferry, dropping us on the island just before 8. The birding was still going strong. In fact, it took us almost an hour and a half just to walk to the end of Dock Road (about ¼ mile)! At least six Cape May Warblers in one cluster of spruces, Rusty Blackbirds were overhead (including one just as our boat docked, a nice welcome to the island), and then a buzz-by from a Cooper’s Hawk. Honestly however, the bird of the day – from an island rarity perspective – was probably House Sparrow. Seriously. A male that apparently landed on the Hardy Boat half way to the island a few days prior had taken up residence here. Were a female to show up – almost certainly in similar fashion – then we could have an issue <insert ominous foreshadowing music here>. The morning flight was hot and heavy on Saturday morning. In fact, there was so much overhead that we barely left the grounds of the Trailing Yew before breakfast. All we could do was stand around, look up, and marvel at the wonders of migration. Hundreds of Yellow-rumped Warblers, 10’s of Palm Warblers, oodles of Golden-crowned and Ruby-crowned Kinglets…2-3 Blue-gray Gnatcatchers, another Dickcissel or two, and a fly-by Blue Grosbeak (the first on the island this fall?) – it would have been overwhelming to quantify, but luckily, when I am away from SandyPoint, I am not nearly as compulsive. Phew. This Blue-gray Gnatcatcher visited us while we were dining on Novelty pizza. Brown Creepers were common, and unusually photogenic, throughout the day. Good birding continued throughout the day. We confirmed a Nelson’s Sparrow in the marsh at Lobster Cove and found a Marsh Wren. 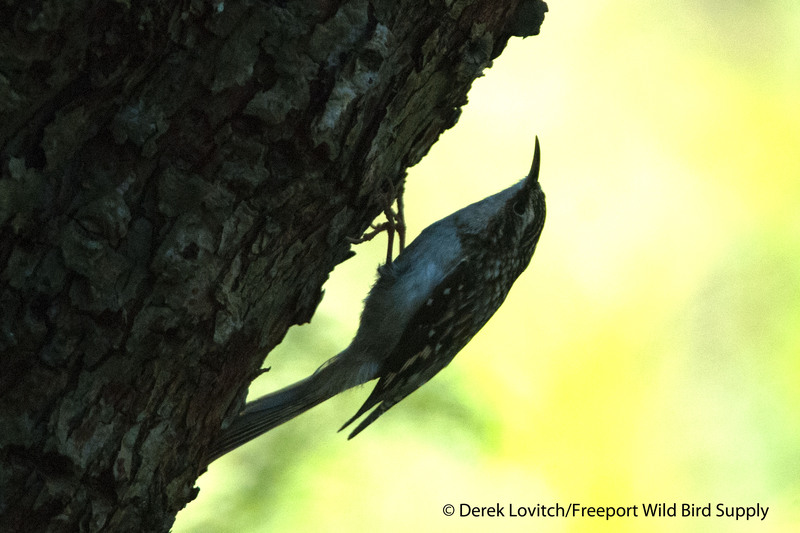 We tallied 17 species of warblers over the course of the day. It was warm. It was calm. It was simply perfect! But we all agreed that the highlight was the afternoon on White Head. 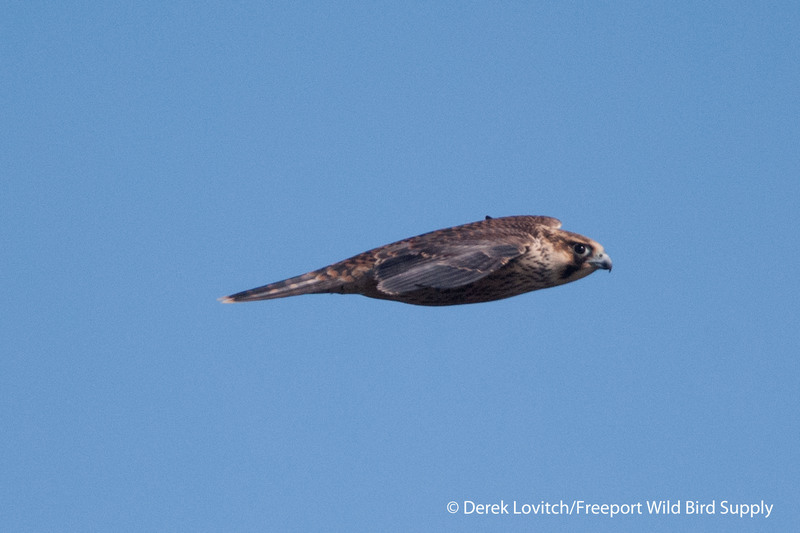 A light southeasterly breeze produced a light updraft off of the cliffs, and Peregrine Falcons were taking full advantage. Some birds were swirling around, doing little more than what could be described only as “playing” in the wind. Some birds were undoubtably passage migrants getting a quick lift from the rising warm air. We know there were at least six Peregrines, as we had a bona-fide kettle of six swirling together at one point. Normally, the hawkcounter in me swings into action. But alas, this is MonhegZEN birding, so I just sat back and enjoyed the show. Sea- and Hawk-watching from White Head. 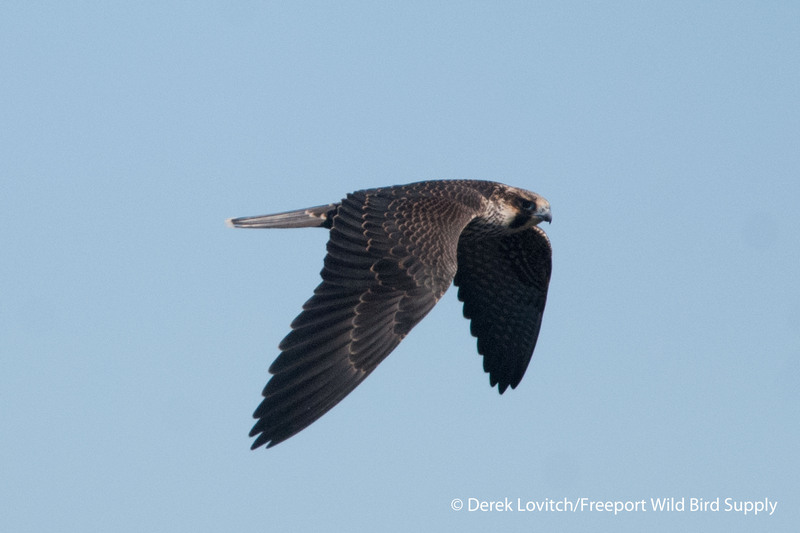 Lots of eye-to-eye Peregrine Falcons, an Opsrey, and a distant Minke Whale or two. 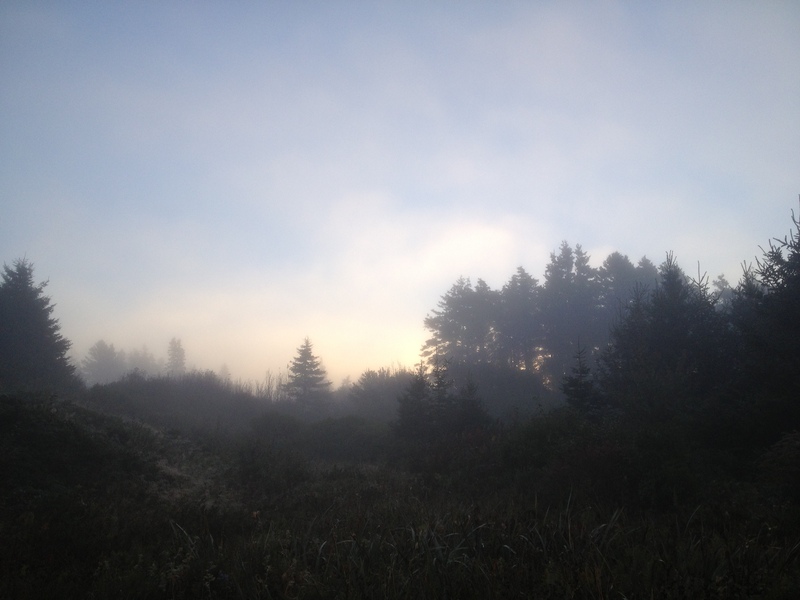 A shroud of fog enveloped the island on Sunday morning, but there weren’t too many birds overhead to be obscured by it. Although there were few birds overhead or moving around once the fog lifted, there was still an ample supply of Yellow-rumped Warblers and Golden-crowned Kinglets. We happened upon a Prairie Warbler, and added a few other species to our trip list, such as two Ruby-throated Hummingbirds, and – finally – Ring-necked Pheasants (how did I go two days without hearing or seeing a pheasant here?). Lark Sparrow, Yellow-billed Cuckoo, Rusty Blackbird, Least Flycatcher (finally, after three days I had an Empid to try and string! )…the list goes on. 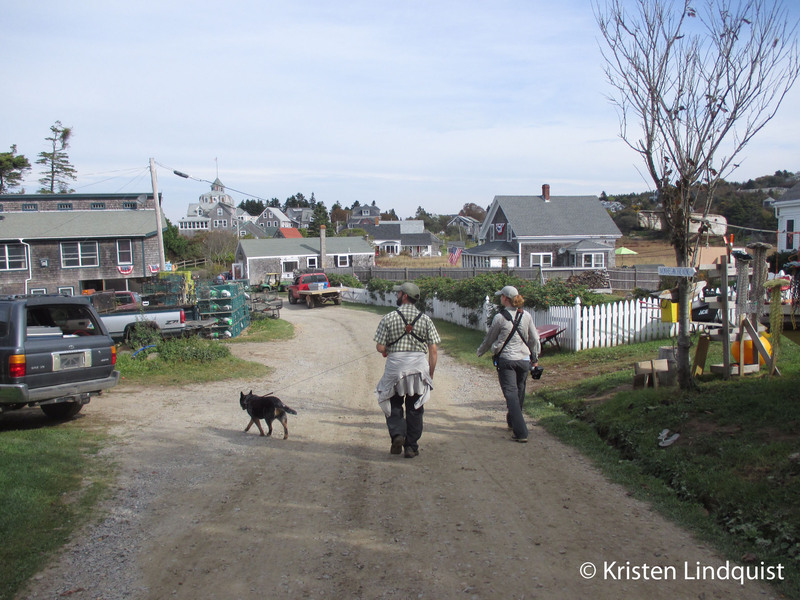 But overall, birding was decidedly slower than the previous two days (note what constitutes a slow day on Monhegan! ), and rather warm. 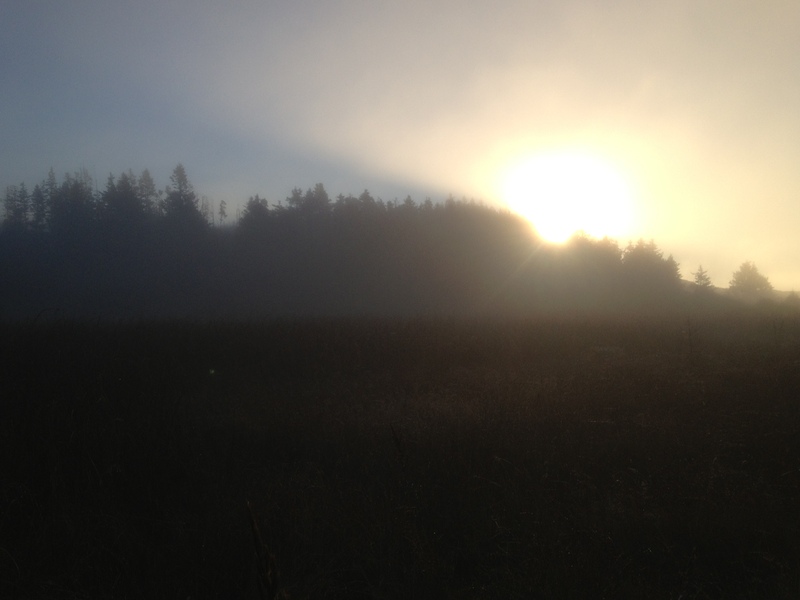 While the birding was slow, we took time to enjoy the scenery in the fog. Remember when I said that all that male House Sparrow needed was a female to arrive? Uh-oh. I am unsure how long it’s been – if ever? 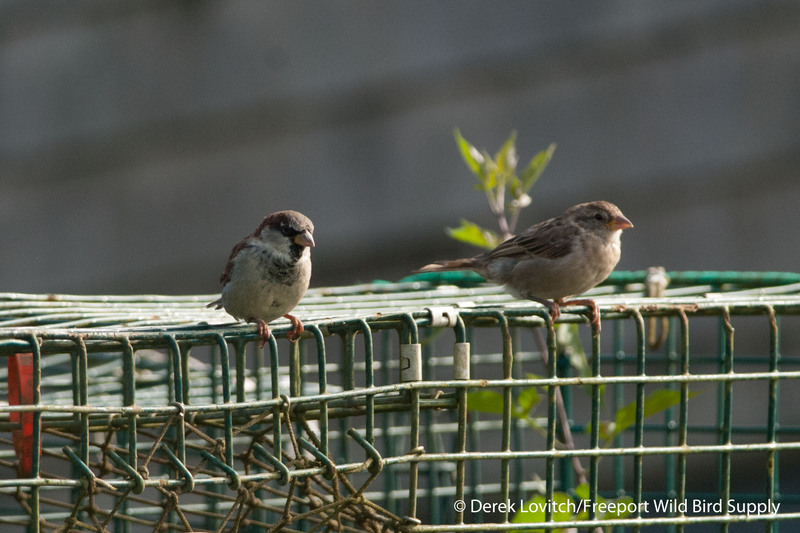 – since two House Sparrows were on the island. While only die-hard island-listers appreciated these birds as much as I did (I remain captivated by the way birds – all birds – find their way to islands and what their lives are like once they get there ), the members of my group that have birded here before at least understood the significance, and potential colonization consequences of this sighting. Luckily, we had other intrigue to talk about as well. 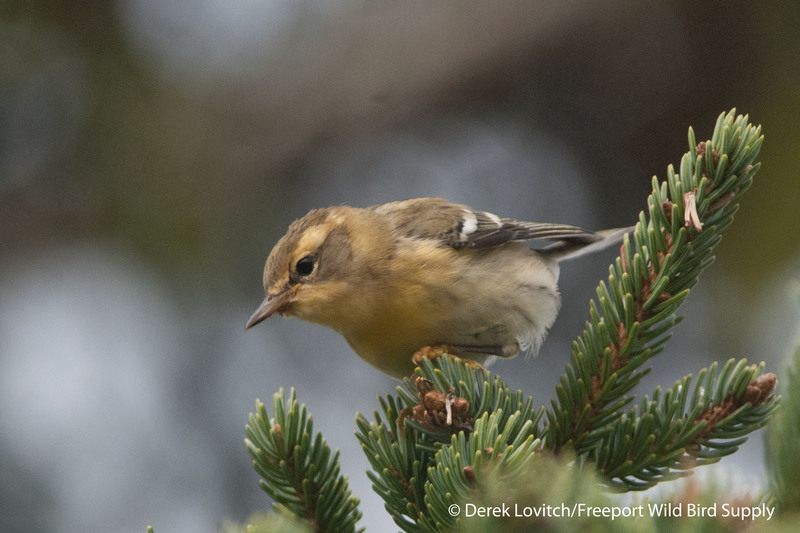 The spruces along Dock Road were happenin’ again today, but one warbler in particular occupied us for a while. I first called it a Blackburnian, and then I back-tracked…a lot. It was so impressively pale, and feeding above us, some of the most diagnostic features were not visible. We spent about a half hour with this bird, which eventually obliged us as it fed in the lowest boughs of the tree. We worked it carefully and thoroughly, taking the opportunity to really learn from this individual. It took a while, but I was finally convinced it was a Blackburnian in large part due to the very pale but distinct “braces” on the back, and what we would (via camera-screen “instant replay”) finally confirm as a small, pale orange central forehead stripe. The orange feet seem odd to me, and the dark auriculars appeared much more contrasting on these photos than we interpreted it in the field. This was a good “learning and teaching bird,” and therefore this was one of my favorite birds of the trip. 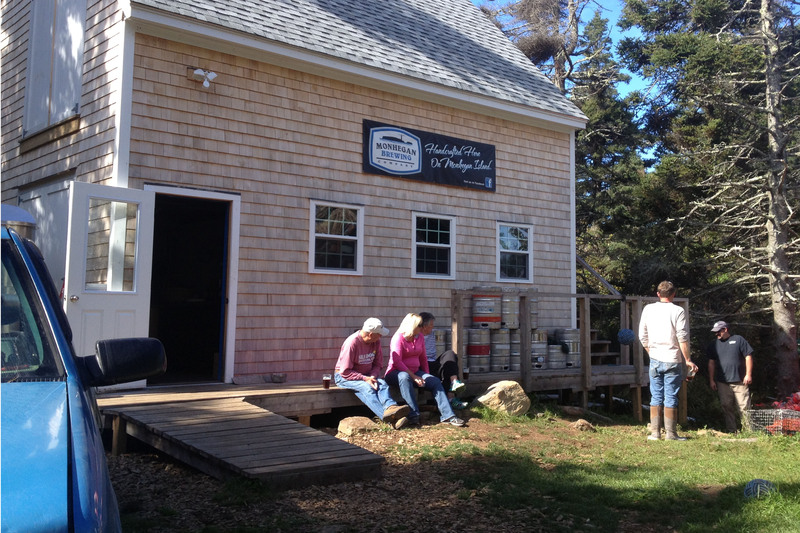 I visited the Monhegan Brewing Company a couple of times for good beer and conversation. And we know good business can be conducted over a beer. In fact, during my last beer there on Sunday evening, I struck a deal with Sue to buy the sunflower heads from the Island Farm. They’re currently drying at our house, but they’ll soon be for sale here at the store. 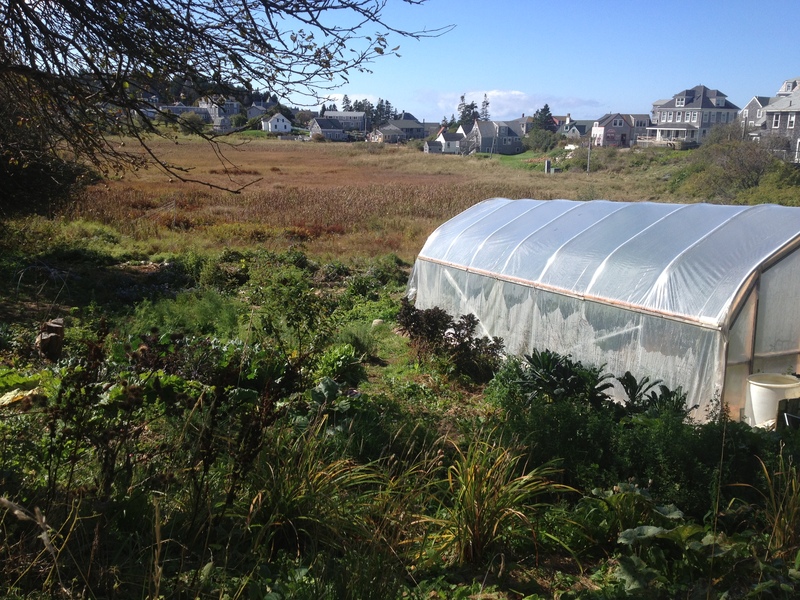 The money will go to help the Island Farm in their pursuit to provide a sustainable source of produce for the island. The gardens are also great birding! Very few birds were on the move Sunday night, and with almost nothing visible on the radar, I didn’t exactly pop out of bed in the morning. I did get out for a little while before breakfast, however, and once again the morning flight – or lack thereof – proved what the radar suggested. My tour had come to an end, but I elected to stay out for the day to bird with my friend Kristen. We both just wished there were a few more birds to see! 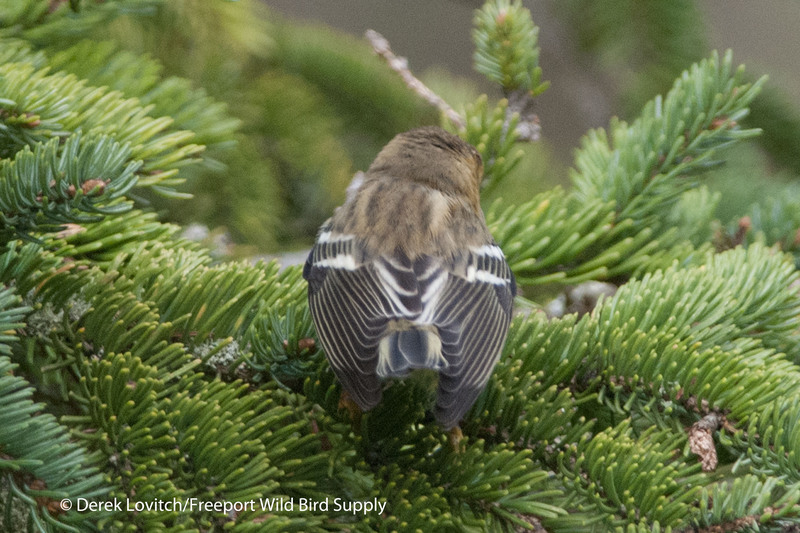 Although I like the photo on the left of the Yellow-rumped Warbler atop a Red Spruce, as you can see on the right, I excel at photographs of fuzzy twigs. 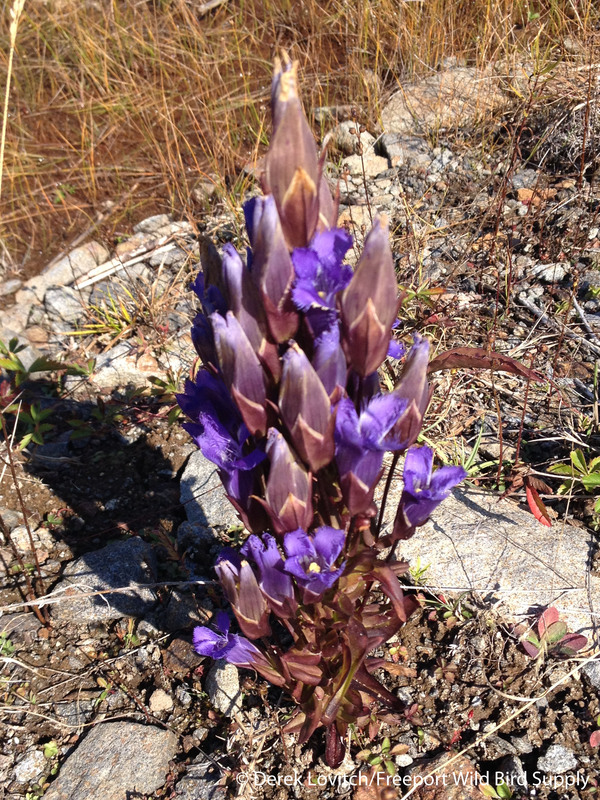 A most impressive Fringed Gentian. We worked the bush hard, checking all sorts of seldom-searched nooks and crannies. Some of our totals for the day were higher than previous days simply because we covered more ground. The Clay-colored and Lark Sparrows continued, as did the two Green-winged Teal in the town marsh. A spiffy Chestnut-sided Warbler was my 20th species of warbler for the weekend, and we added a few more waterbirds to the list by dedicating some time to sea-watching and scanning the gulls in the harbor. Unfortunately, most of the afternoon – following one last pizza – was spent keeping an eye on our watches and watching our time rapidly tick away. At least we weren’t nursing a concern about leaving hot and heavy birding – it was slow, very slow, today, and that did make our departure a little less unwelcome. A little; it’s never easy to leave this magical place. 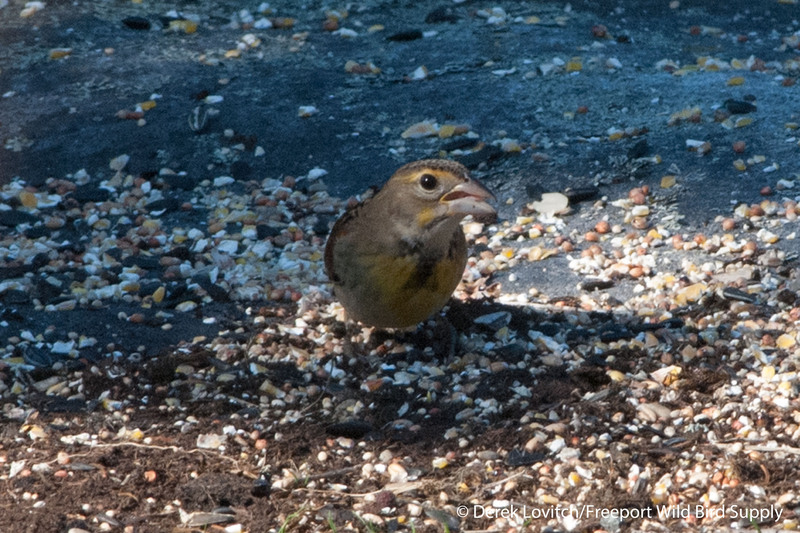 This entry was posted in Private Guiding and Tours and tagged Birding, Blackburnian Warbler, Clay-colored Sparrow, Dickcissel, guiding, House Sparrow, Lark Sparrow, Maine, migration, Monhegan Island, Peregrine Falcon, radar, Tours, trips, Yellow-rumped Warbler on October 3, 2013 by Derek. On a morning with a big overnight migration in the fall, there’s no where I’d rather be than SandyPoint. I just wish there was a direct ferry from there right to MonheganIsland. 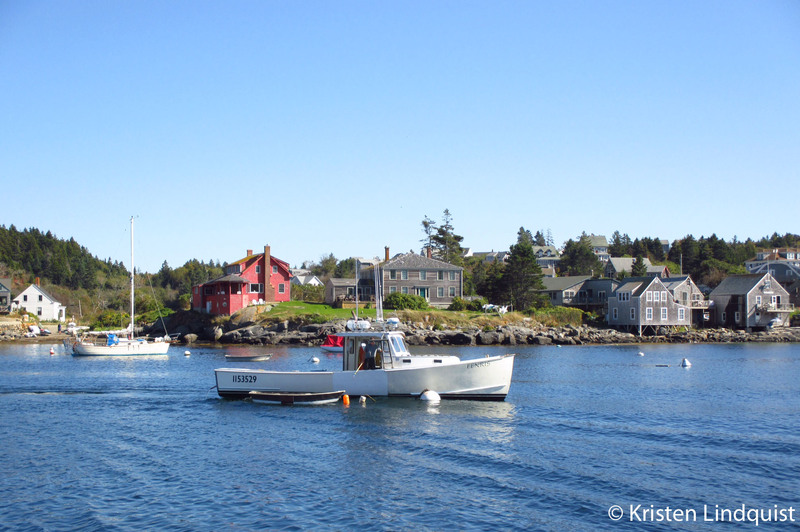 Any other time, I would just rather be on Monhegan. While our annual MonhegZEN Fall Migration Weekend coming up this weekend (still some space available), Jeannette and I headed to the island Friday through Sunday for a few days of birding and visiting with friends. It was kinda odd being there without a group! Not surprisingly, I did not bird much less hard. 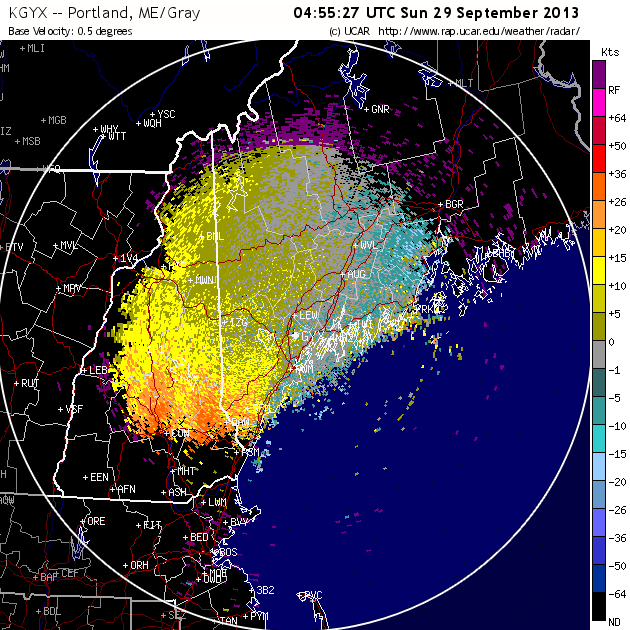 I’ll post some radar images from the weekend on a forthcoming blog entry that I hope to post by day’s end. A decent flight Thursday night into Friday produced a fair amount of birds on the island, even after our late (relatively speaking) arrival at 10:00am, and even though it seemed – as is often the case on calm mornings – birds that arrived at dawn continued on to the mainland. 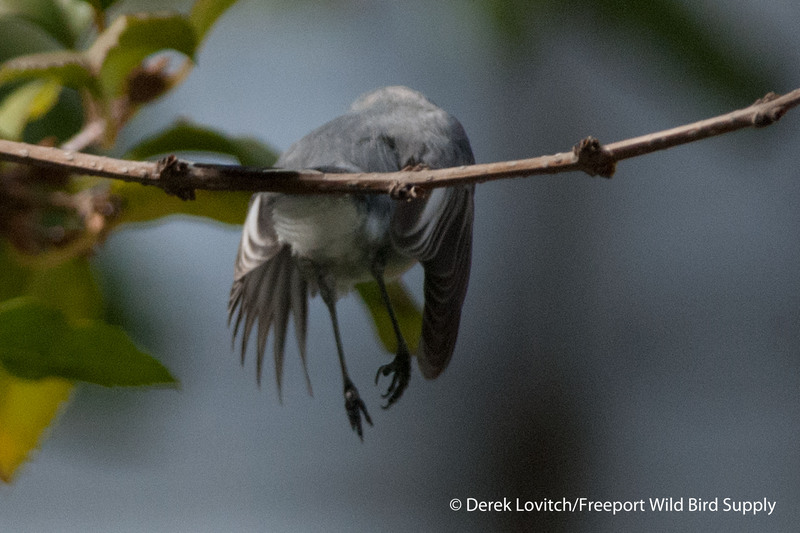 Three of our first handful of species, however, were Philadelphia Vireo, Cape May Warbler, and Yellow-billed Cuckoo. 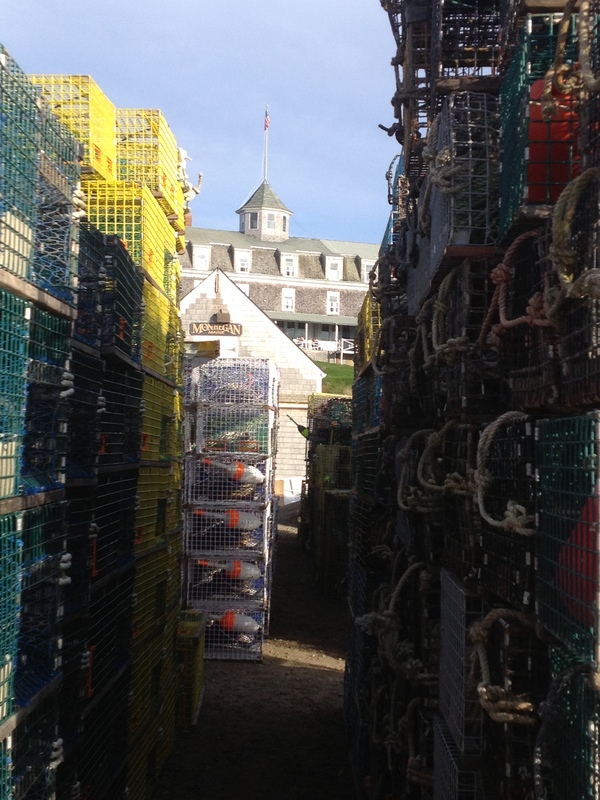 Welcome (back) to Monhegan. 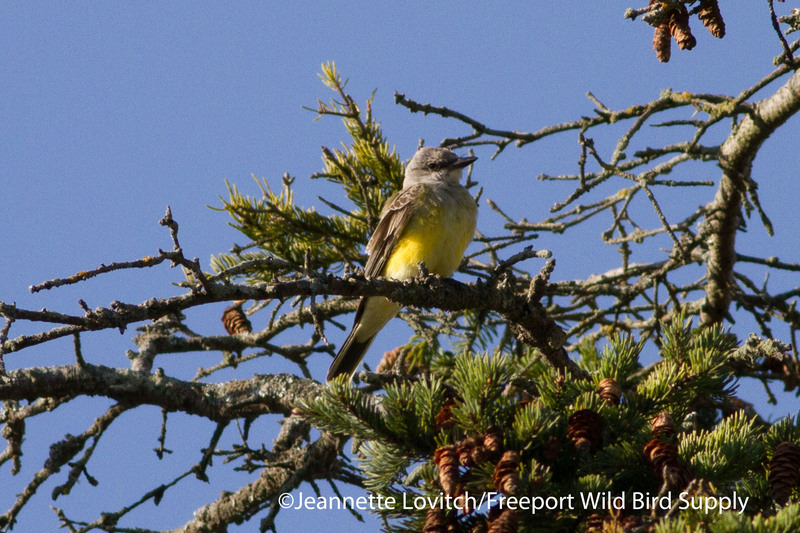 The birding improved in the afternoon, highlighted by a Western Kingbird. 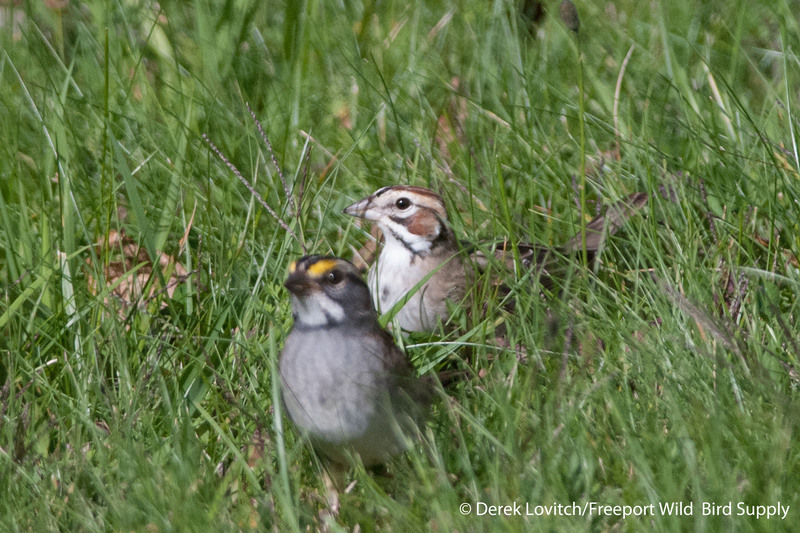 A Lark Sparrow and two Dickcissels – all present for a few days – were enjoyed (here, one of the Dickcissels with the Lark Sparrow and a White-throated Sparrow in the background). 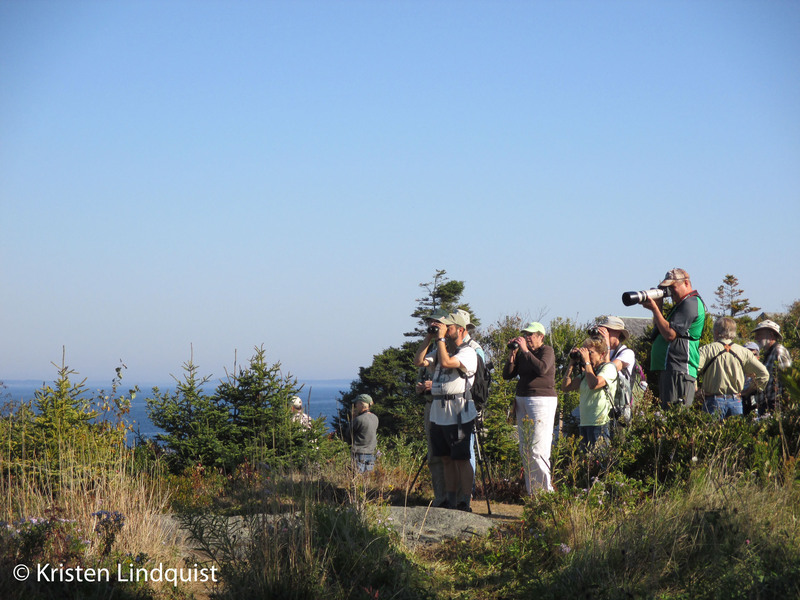 Typical “Monhegan Trash Birds:” birds that are noteworthy anywhere else in the state but are fully expected in an autumn visit here. We ended up with 67 species of birds on the day, including 11 species of warblers. Yup, a slow day of birding on Monhegan beats a good day of birding almost anywhere else. Light southerly winds that developed over the course of the day became calm by nightfall, and call notes early in the night were suggestive of birds departing the island. With a southerly flow aloft, I didn’t have high hopes of a lot of new arrivals for the next morning. The radar image was, simply put, was weird – some sort of temperature anomaly or perhaps a malfunction, so I couldn’t use that to confirm or alleviate my concerns. A mere handful of bird overhead at dawn on Saturday morning confirmed it though – there was not much on the move overnight. Fog rolled in and out for most of the morning, clearing out in the afternoon on an increasing south to southwesterly breeze. We beat the bush hard, and covered a lot of ground, but birds were hard to come by. There were quite a few more Yellow-rumped Warblers around than on previous mornings, Kristen noted, and we added plenty of species to our trip list over the course of the day. 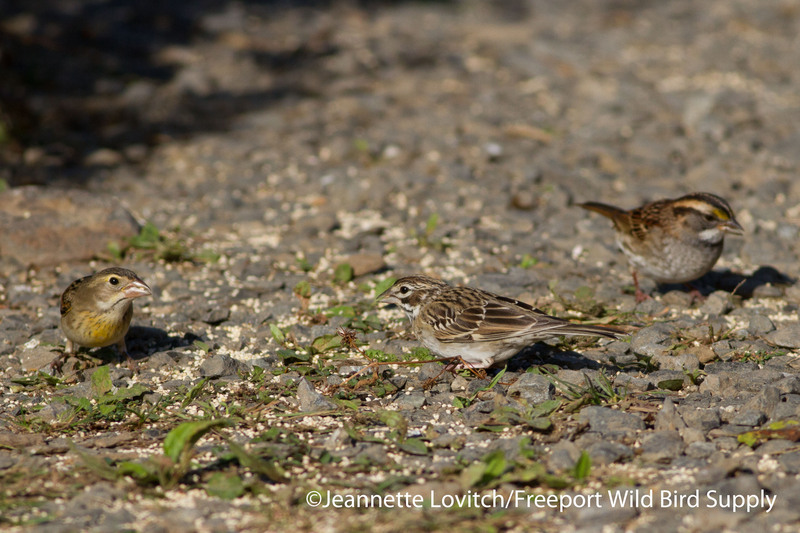 While the Dickcissels apparently departed, the Lark Sparrow continued, and the island was now up to three Clay-colored Sparrows. Clay-colored Sparrows, Dickcissels, and Lark Sparrow, check: the triumvirate of Midwestern regular-rarities out here. Two adult Lesser Black-backed Gulls, a tarrying Eastern Kingbird, a Semipalmated Plover, and a good afternoon Northern Gannet show were the other highlights of what amounted to be an exceptionally slow day of birding for Monhegan in the fall. 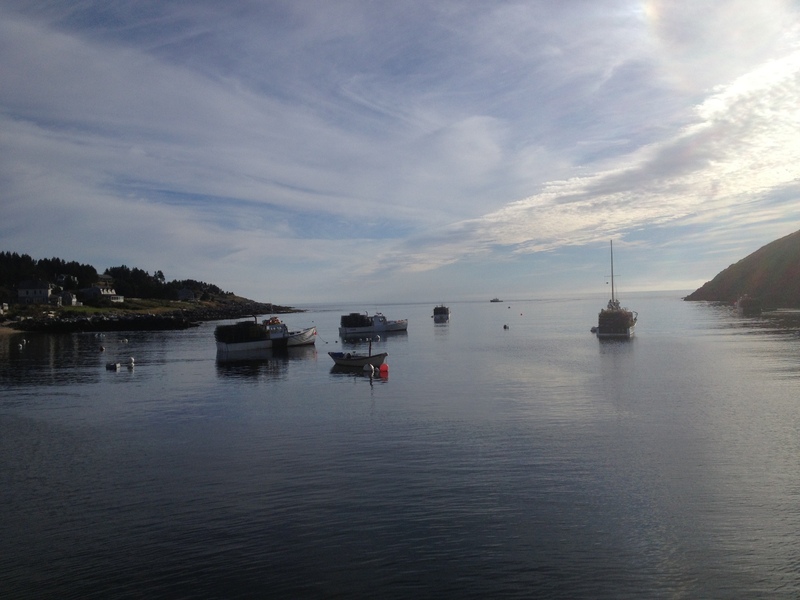 Nevertheless, complaints were not uttered – we were on Monhegan! – and besides, I got to mooch a TV (Thanks Paul and Sue!) to watch Rutgers come from behind to defeat Arkansas in an exciting finish, and we visited the Monhegan Brewing Company. Yup, tough day. 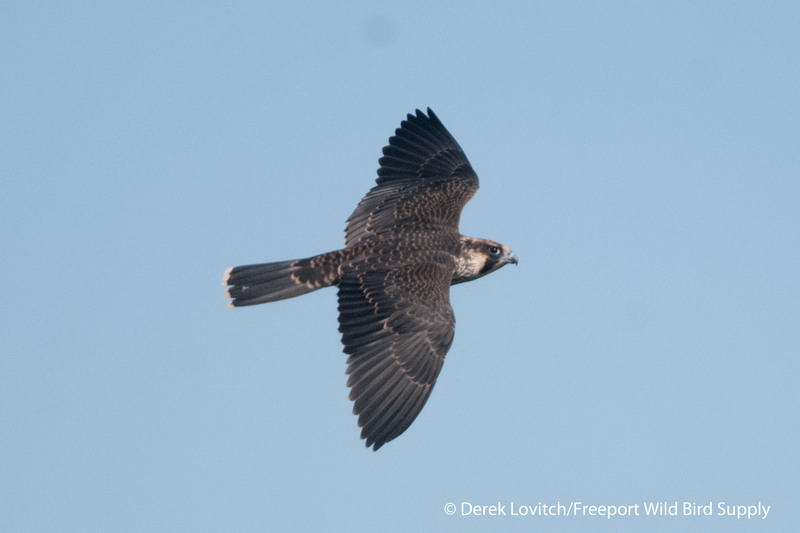 This young Peregrine Falcon – with a bulging crop from its last meal – also had a good day. Unfortunately, an increasing southerly wind overnight precluded much in the way of any migration. Take a look at the next blog to see what “almost nothing” looks like on a radar image. Clouds were thick by dawn, too, but the rain held off until after breakfast. After another fulfilling and scrumptious breakfast at the Trailing Yew, Jeannette, Kristen, and I headed down to Lobster Cove for a bit of seawatching. We could see the wall of rain on the radar, and we could now see it on the horizon. But as it marched closer, tubenoses joined the gannets. In a mere 15 minutes or so, 20+ Great Shearwaters and 6+ Sooty Shearwaters zoomed through my scope. And then the skies opened up. 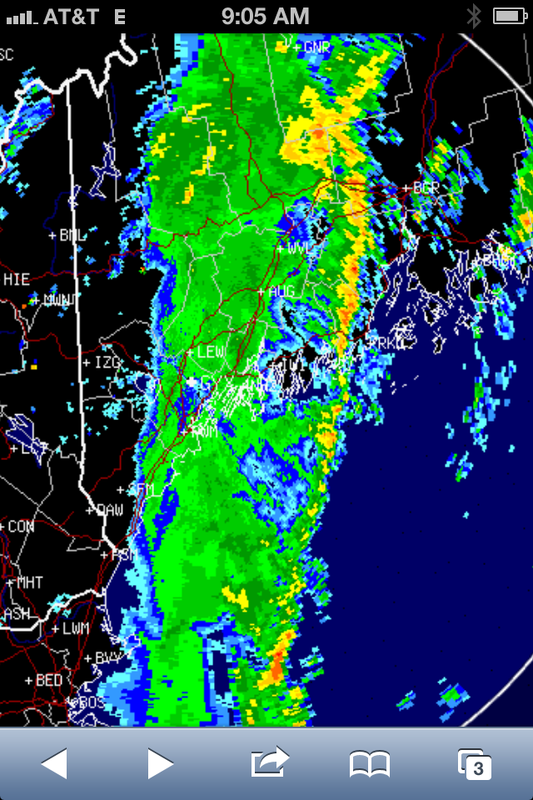 This is what a line of rain – ahead of a cold front – looks like on the radar. The southerly winds were diminishing as the rain tapered off rather quickly over the course of the morning, but seawatching was less productive before lunchtime – apparently those tubenoses were all on the move just ahead of the precipitation. But with the sun beginning to peak out after lunch, at least more birds were more visible again: two of the Clay-colored Sparrows, a Philly Vireo, etc. 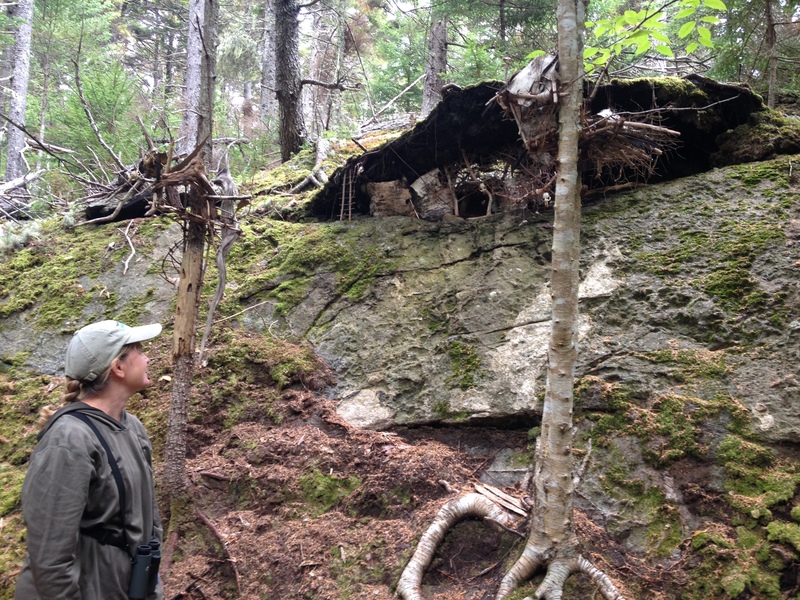 Joined by Paul and Doug, we encountered a – or the – Yellow-billed Cuckoo, and then a calling flyover Lesser Yellowlegs became my 202nd species on Monhegan. Moments later, Paul spotted a night-heron in a narrow drainage, and Doug soon relocated it. 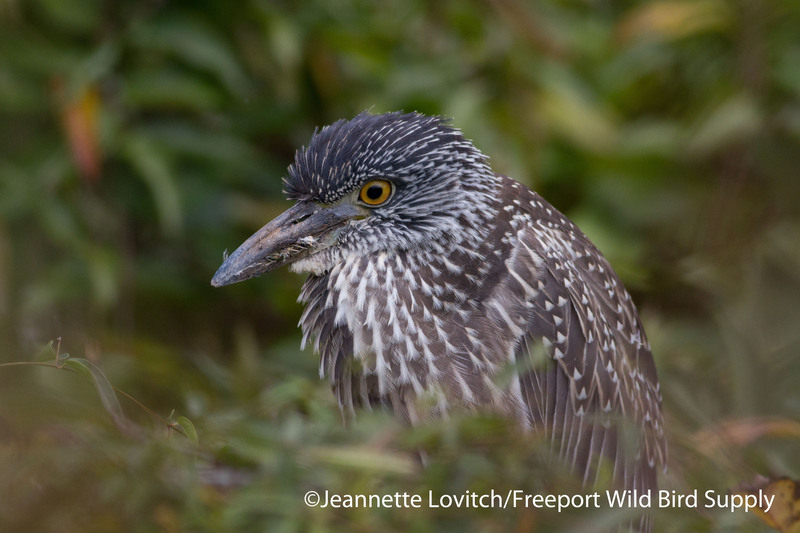 A juvenile Yellow-crowned Night-Heron! Once a more regular bird in Maine, and even on Monhegan, it had been about a decade since one had made an appearance on the island. But this bird showed up a couple of weeks ago, and was often seen foraging on grasshoppers in lawns. Rumors of its continued presence were circulated, but there were no confirmed sightings for over a week. Until today. Monhegan bird #203! And two island birds in about 10 minutes. Now that’s the way to finish strong. When it was time to go, we were very happy to see the waves were rapidly dropping off. Seven foot seas this morning had been reduced to 3-4 at most as we hopped on the Hardy Boat for the trip back. A Great Cormorant on the Outer Ducks was our 88th species for the Monhegan tally for this trip, but 88 –including a mere 13 species of warblers – was a fairly low total for three days out here at this time of year. That being said, it could have been much lower had we not continued to beat the bush. Two juvenile Lesser Black-backed Gulls joined some hopeful Herring Gulls following the boat to shore, and westerly winds were increasing as the cold front pushed through. 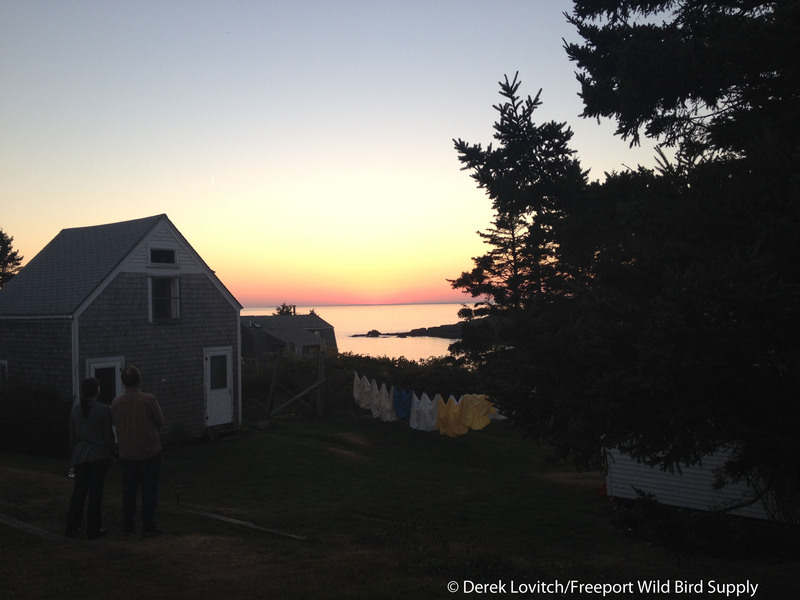 There would no doubt be a lot of new birds come morning on Monhegan. While I would be sorry to miss them, I knew fun was going to be had at SandyPoint, so I was not upset. This entry was posted in Birding in Maine and tagged Birding, Clay-colored Sparrow, Dickcissel, Lark Sparrow, migration, Monhegan Island, Peregrine Falcon, warblers, Weather, Western Kingbird, Yellow-crowned Night Heron on September 23, 2013 by Derek.